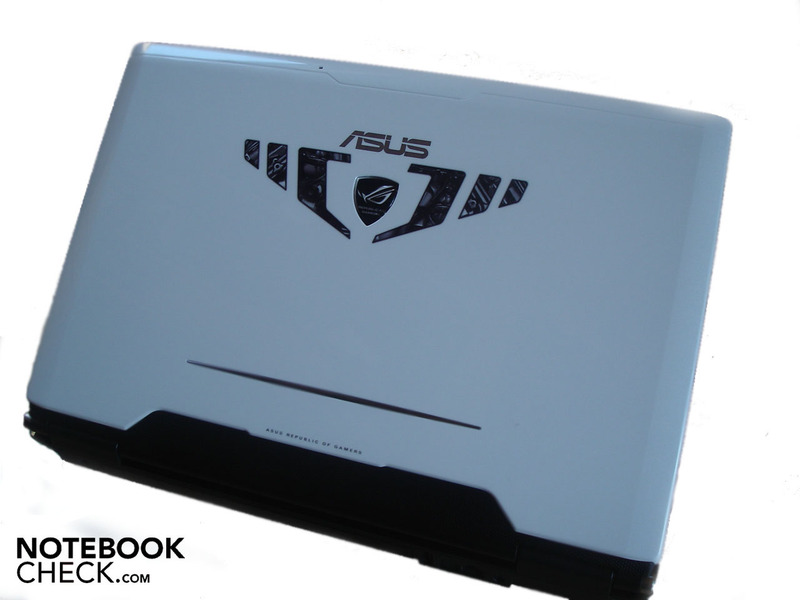 Asus shows courage for design and equips the G60VX with a white notebook lid with a futuristic stamp. There is also a Core 2 Duo T9400 and a GeForce GTX 260M that provide for exceptional performance values inside of the 16.0 inch case. 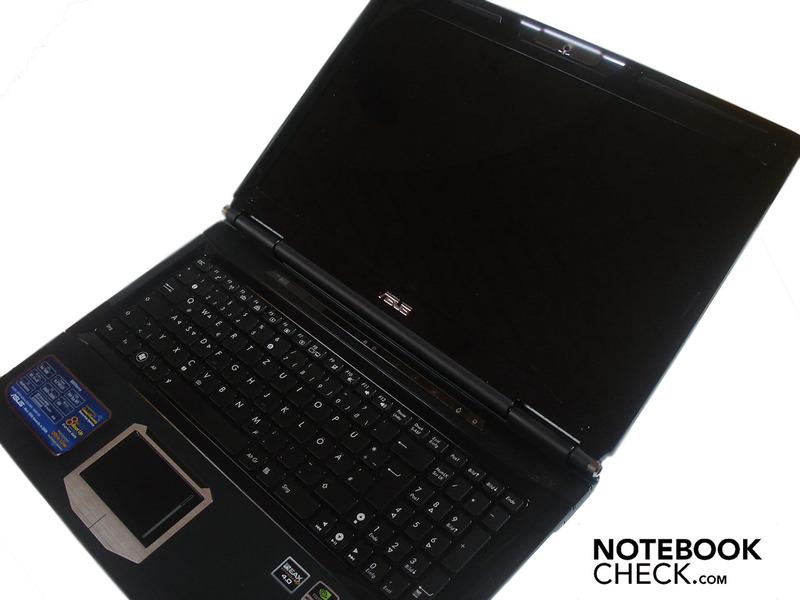 We have looked at the notebook closer and clarified the question if Asus has achieved to make a replete gaming notebook with the G60VX that can impress even beyond its looks. An efficient GeForce GTX 260M, four GByte DDR2 RAM and two hard disks with a capacity of 320 GBytes each is found in all G60VX model alternatives available at the moment. Only the processor differs in every model. 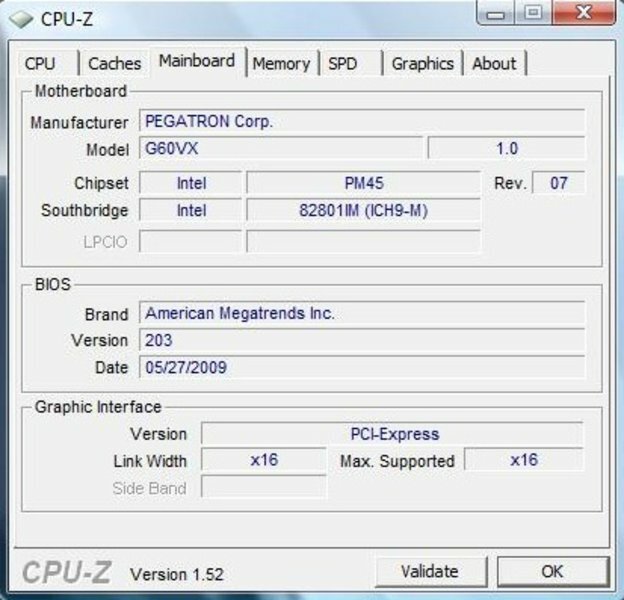 An Intel Core2 Duo P8700 with 2.53 GHz (3 MByte L2-Cache, 1066 MHz FSB, 25W TDP) is used in the G60VX-JX006K priced at 1200 Euros. We have chosen the 1400 Euros expensive alternative, the G60VX-JX003C, right away that bids a Core 2 Duo T9400 with 2,53 GHz (6 MByte L2-Cache, 1066 MHz FSB, 35W TDP). 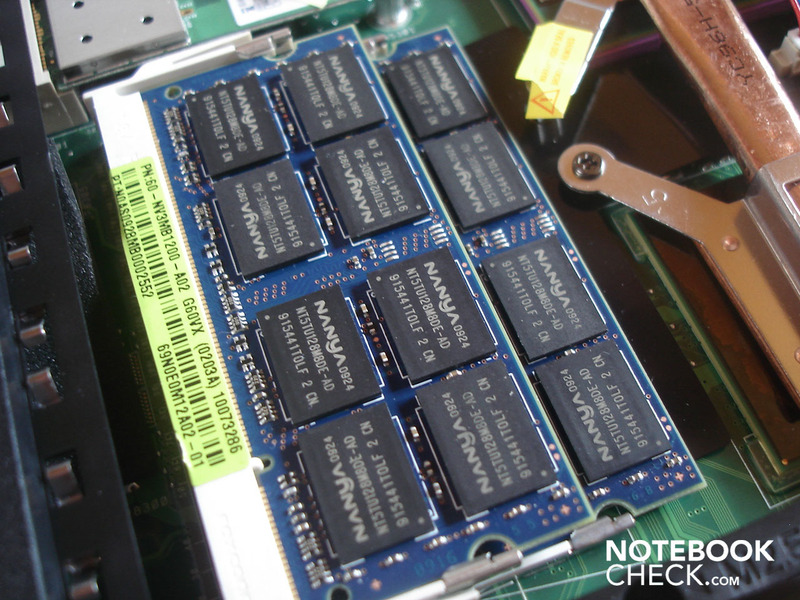 The only slightly more expensive G60VX-JX144C with a Core 2 Duo T9500 with (6 MByte L2-Cache, 1066 MHz FSB, 35W TDP) waits at the upper end of the product range. The models with P8700 and T9500 are scarce; merely the alternative with the T9400, tested by us, exists in a sufficient quantity. At first sight, the optically visible relationship to the larger 17 inch brother, Asus G71GX, can be seen immediately. Except for a few details, the cases equal each other in construction like two peas in a pod. However, the G60VX differs partly in its color and the applied materials. 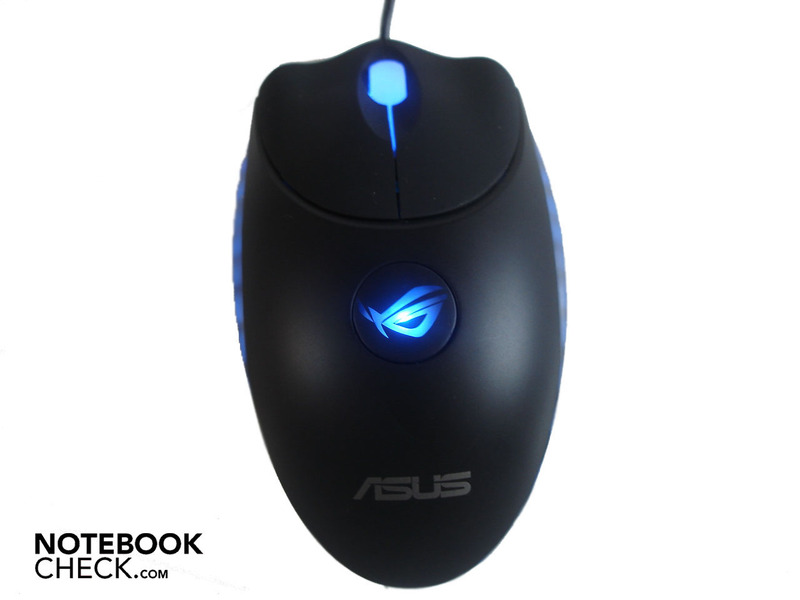 Asus is more restrained and has designed the G60VX more reticent, in opposition to the G71GX. The white display lid with its futuristic stamp strikes right away, but the rest of the case remains appreciably more subtle in its dark blue/ black combination than the G71GX with its partially glaring red surface. 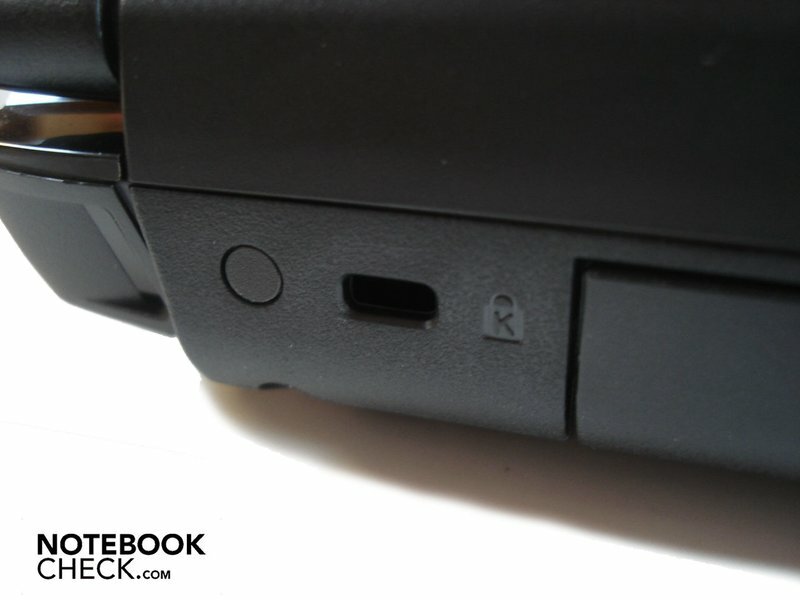 The G60VX also has a light but in opposition to the G71GX, it's restricted to the "Republic of Gamers" logo and a horizontal bar, which are both found on the display lid. 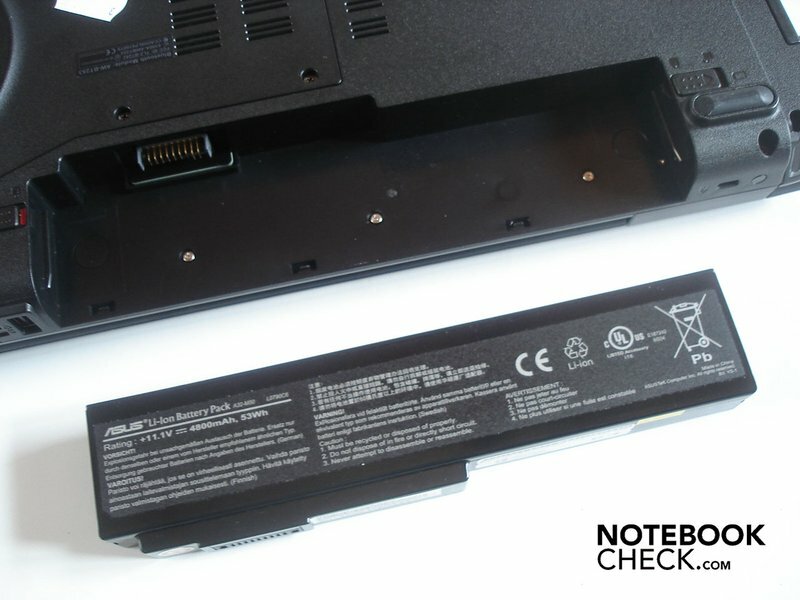 Asus has (fortunately) waivered on the two vertical and wildly blinking bars that fight for attention in the G71GX. The palm rests are made with a thin rubber coating and therefore already have a higher quality look than the gray "honeycomb pattern" of the G71GX. In opposition to this, the rest of the case is quickly sobering. 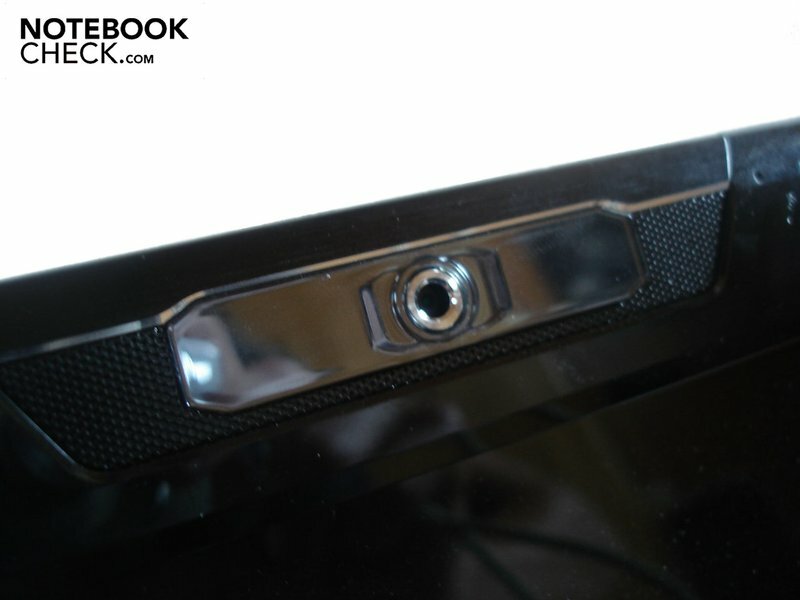 Instead of using high-end materials, like for instance aluminum, Asus applies mainly cheap plastic. This fact of the G60VX can at least be forgiven to a degree, since this is only obvious when looking closer. As to the workmanship, the notebook scores overall fairly good. By and large, the G60VX has been manufactured cleanly and barely any sharp or hard edges could be sordidly noticed. 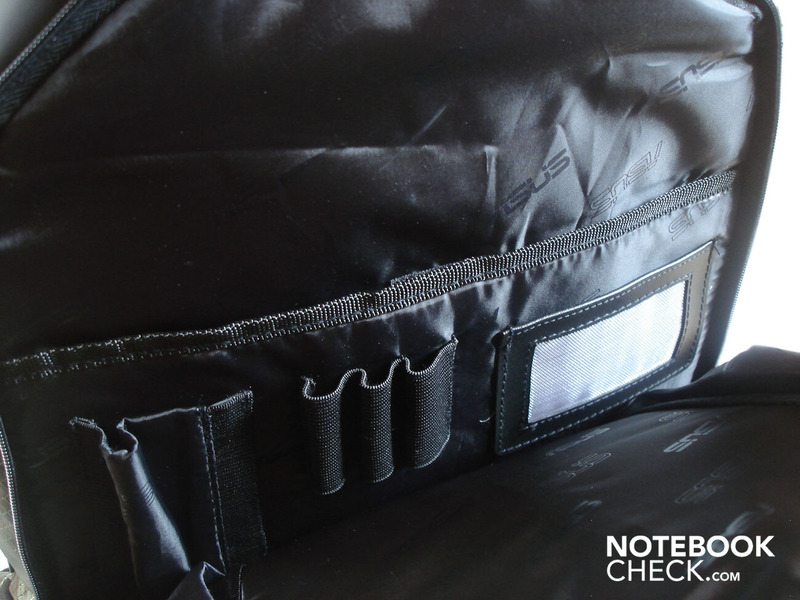 The only drop of bitterness: The left display lid of our prototype flapped at light pressure, as it seems it hasn't been fixated properly. The stability is subject to even more criticism. 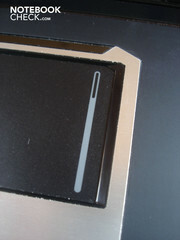 The display lid can be twisted extremely on the outer side. We had the feeling the display could even be damaged at higher pressure. The area between the hinges give in considerably, whereby you have to almost fear breaking the display or tearing the lid out of its nook. Finally, the status bar above the keyboard also yields slightly, as it's only a few millimeters thick and the battery is found directly underneath it. In return, the rest of the case, just like the bottom, is fairly stable. Let's now go to the hinges, which do their job stably and reliably. 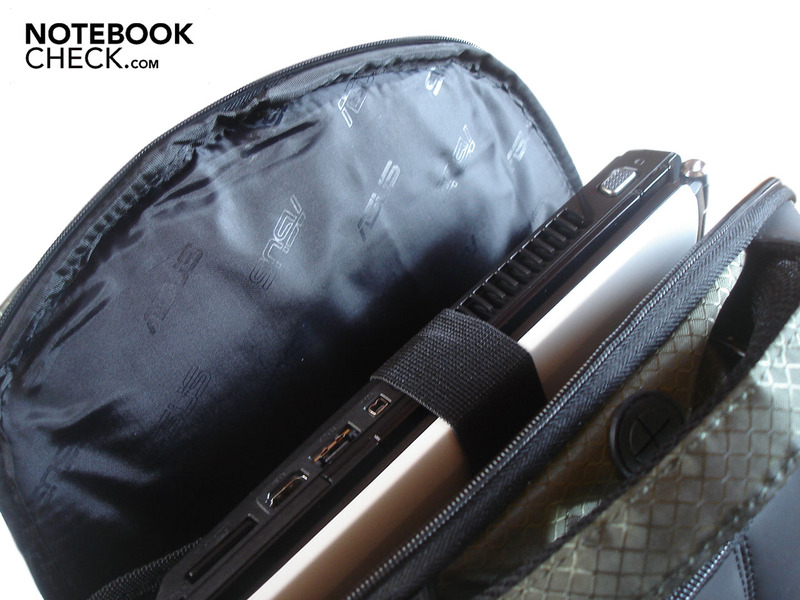 Unfortunately, the case swivels along at opening, despite a proper weight of 3440 grams. 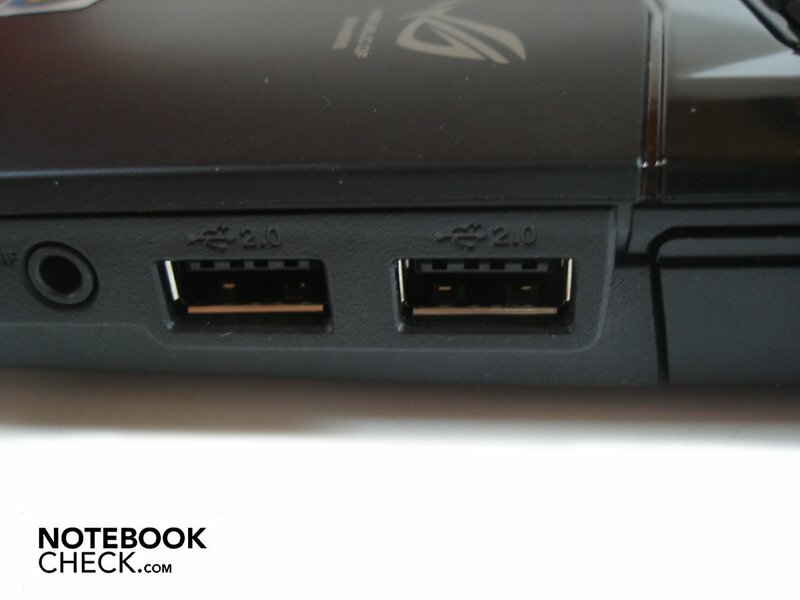 Asus presents themselves as more than generous in view of connections. 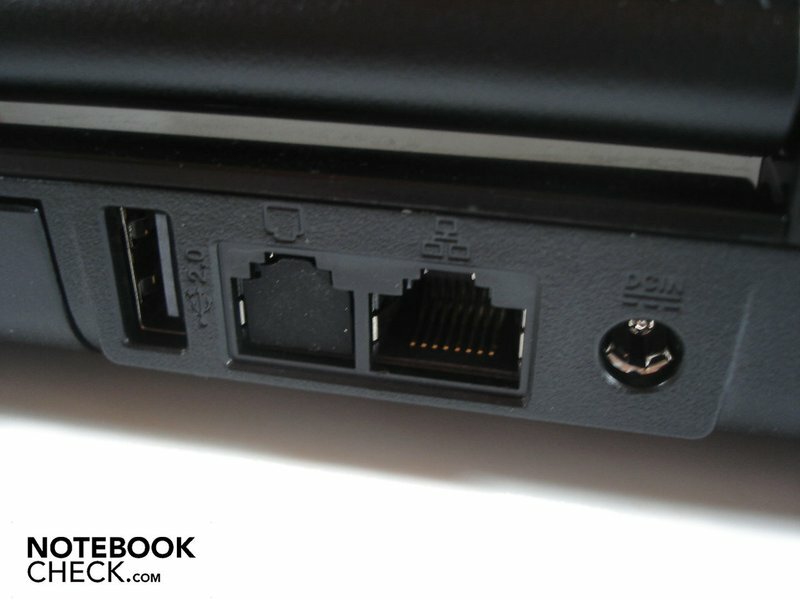 We'll start with the back, which has a USB 2.0 port, a RJ-45 Gigabit LAN port and the power socket. In return, there is a VGA-out followed by a further USB 2.0 port, a Firewire as well as an eSATA port and an HDMI-out on the left. 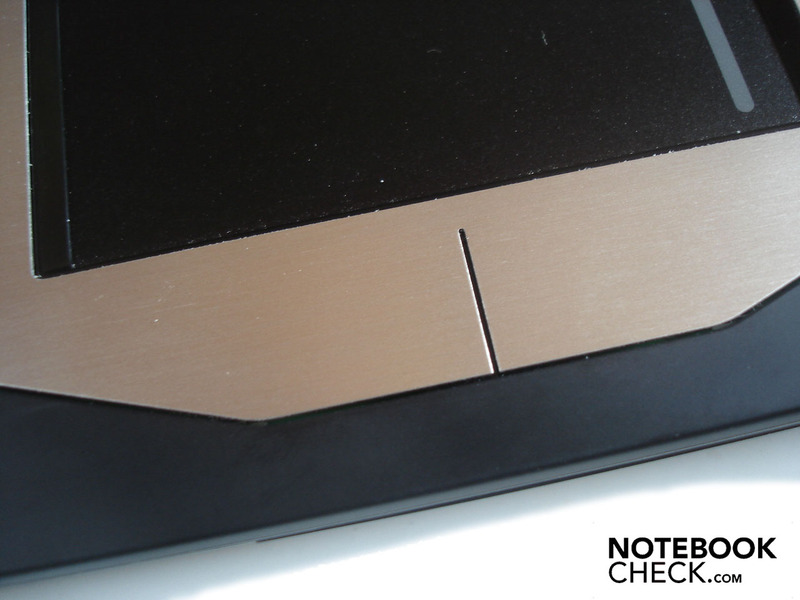 An ExpressCard slot and an opulent 8-in-1 cardreader, proficient of SD, mini SD, MMC, MS, MS Pro, MS Duo, MS Pro Duo and XD, finishes the array. The G60VX's front bids an infrared receiver and a slider for activating and deactivating the integrated WLAN and Bluetooth. Finally, on the right, three audio sockets (headphone-out, microphone-in and line-out), two USB 2.0 ports (there are a total of four USB ports available) and the compulsory DVD burner reside. 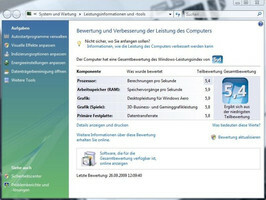 The interface distribution appealed to us, in particularly on the back. 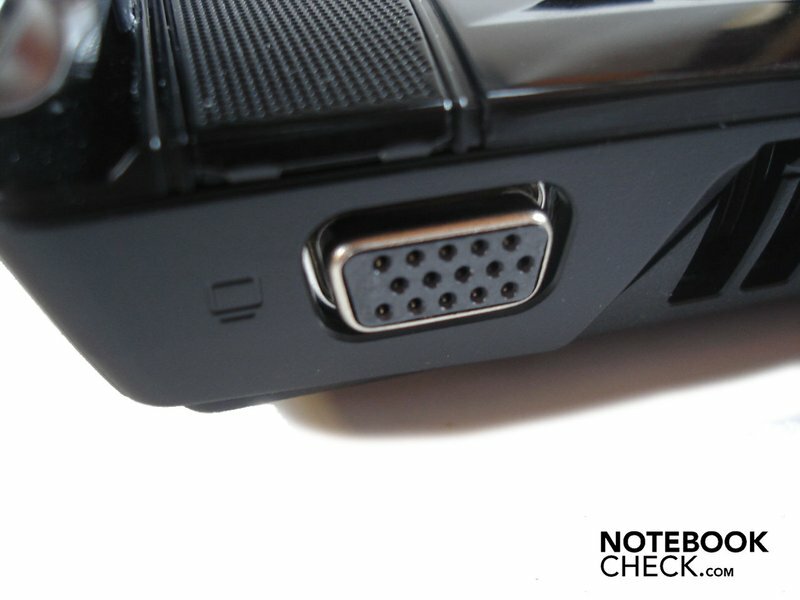 Gamers connect the adapter, the network and a mouse, as the most important cables, there and the lateral areas can theoretically remain unfettered. 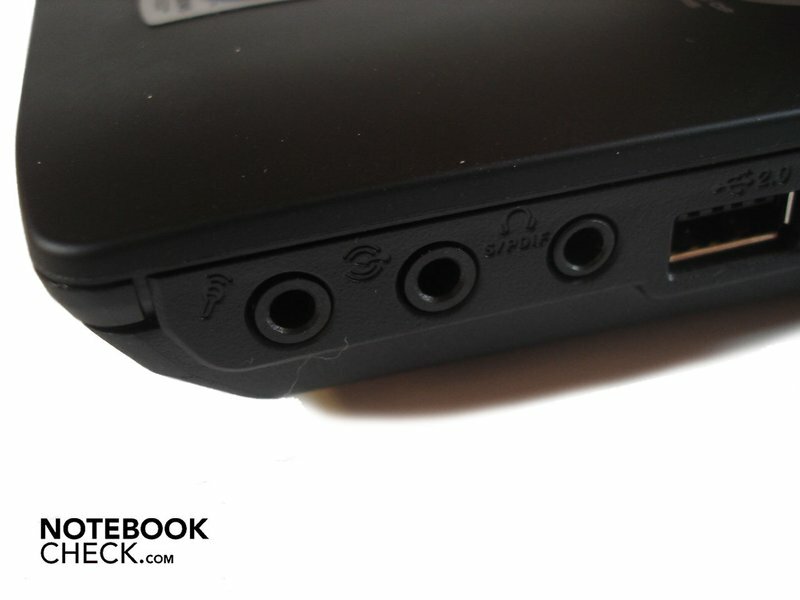 Those who would like to connect an external sound system or maybe even an external monitor won't come around the sides, though. 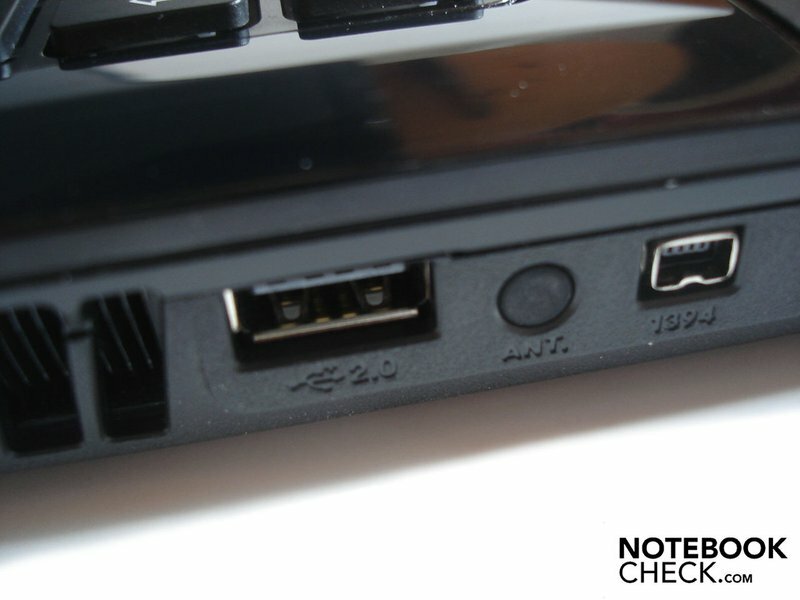 Particularly the HDMI and audio outputs have been placed too far front for our taste and the according cables might turn out to be obstructive. In view of the software configuration, the integrated Express Gate is especially striking, which can be triggered with a certain button. Express Gate doesn't boot the operating system, but instead presents a refined desktop within seconds, with which various functions can be controlled. For instance, a small web browser is included. Furthermore, it's possible to render music and pictures or play various online games via a special platform. Conclusively, there is also the option of using Skype and other instant messaging programs. The control of Express gate is cordially self-explaining and the speed is also alright. So for those who want to quick check their emails or look at the pictures of the previous holiday is at the right address here. 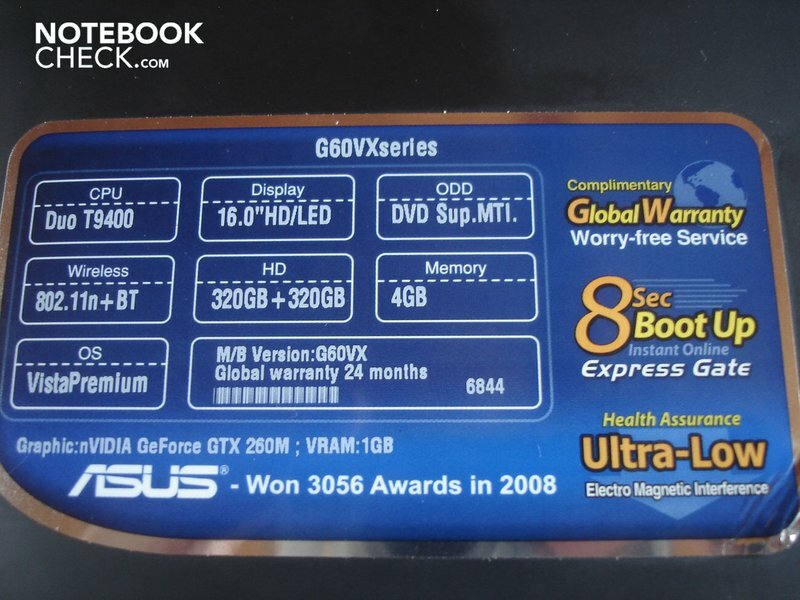 The big highlight of the G60VX is probably its comprehensive supplies that are found in the package. 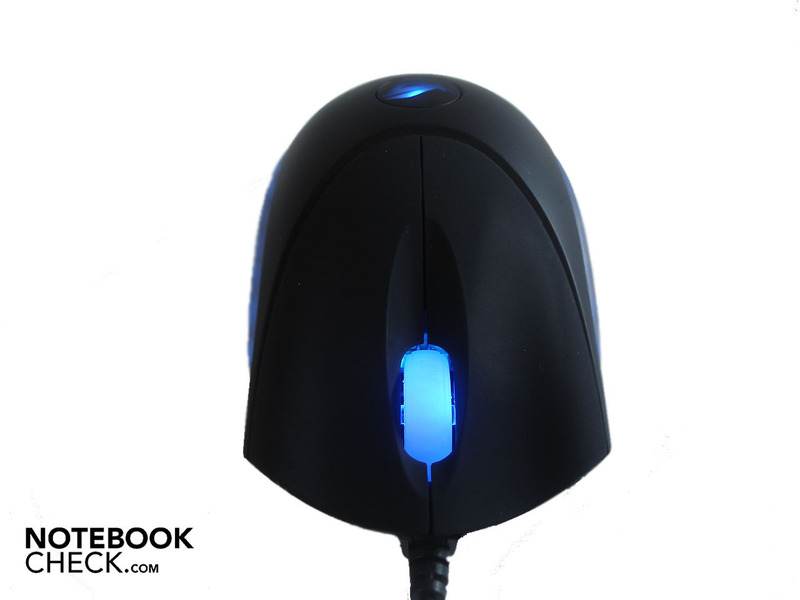 A Razer Copperhead, a high-quality gaming mouse that can score with its high precision and a blue light among other features, waits in a small, unobtrusive parcel. Aside from that, there is also a big backpack for a handy transportation of the G60VX in the box. The backpack is in a green snake skin design and managed to thrill us completely. 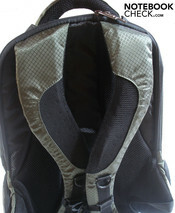 The workmanship is excellent and the used materials make an overall high-quality impression. 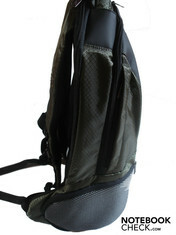 Additionally, the backpack sits very comfortably on the back, is extremely well-cushioned and equipped with an incredible amount of pockets and compartments that only wait to be filled. 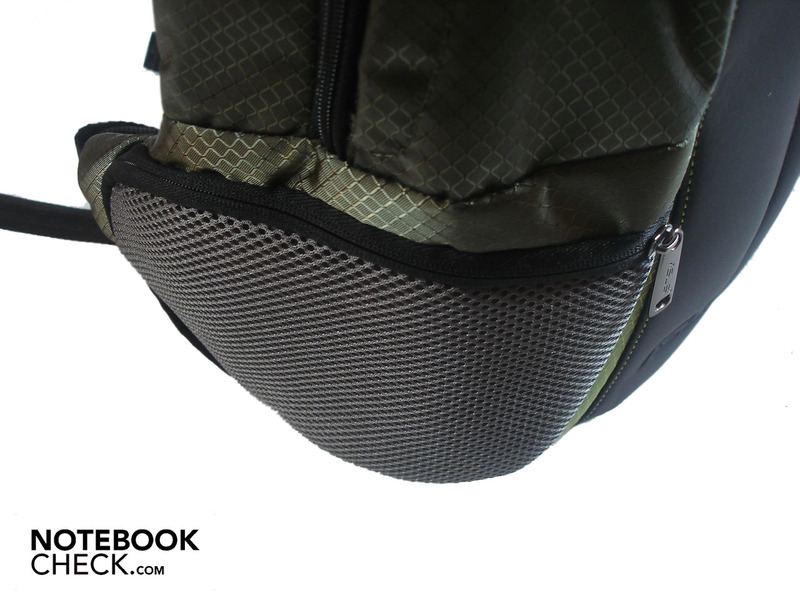 The backpack isn't only perfect for carrying the notebook, but is equally suitable as a school, travel or hiking knapsack. The keyboard couldn't convince us even after dozens of hours of use. The reason for this is the mediocre stability. 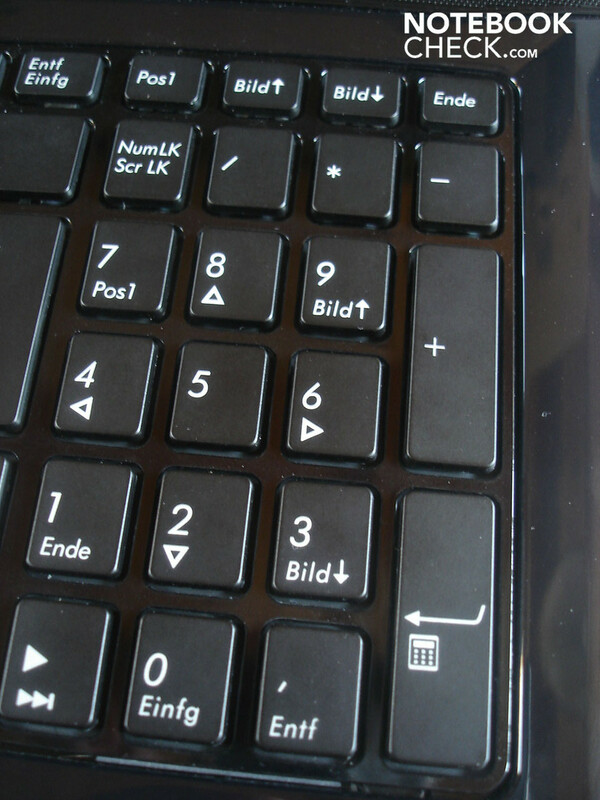 The keyboard yields considerably, particularly in the center and in the area of the numerical block. We found key stroke was too indistinct and the triggering noise of the keys too clattery. Grime is gathered quickly in the large spaces because the keys are fairly small. However, the spaces can be cleaned quite well. 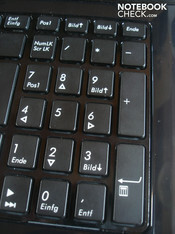 The arrow and numerical block keys aren't only small, but also narrower than the rest, which is why typos are common. 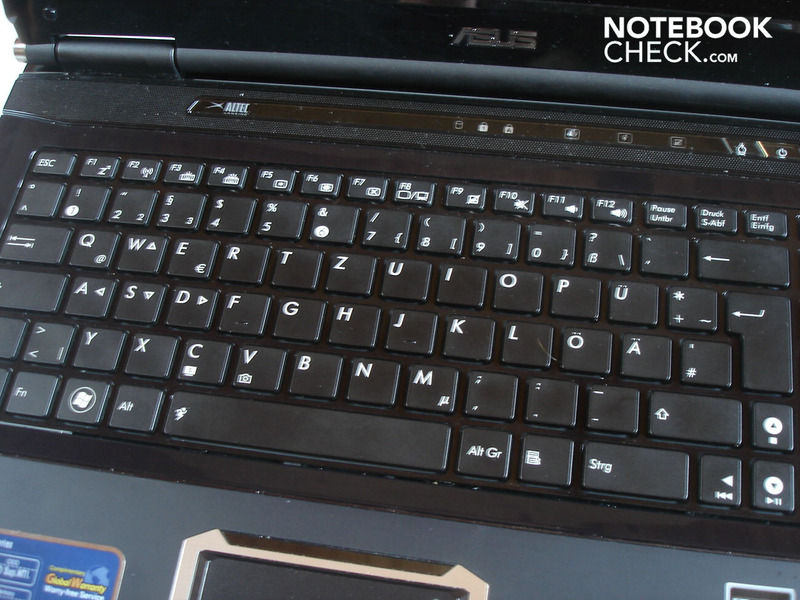 A further flaw turns out to be the slightly wobbly keyboard construction, which can even be marginally displaced when pressure is applied with the fingers and the hand is moved upwards or downwards. This all sounds like a lot of critique at first, but the keyboard still scores much better than the, for example, keyboards of MSI gaming notebooks, in view of stability and key stroke. 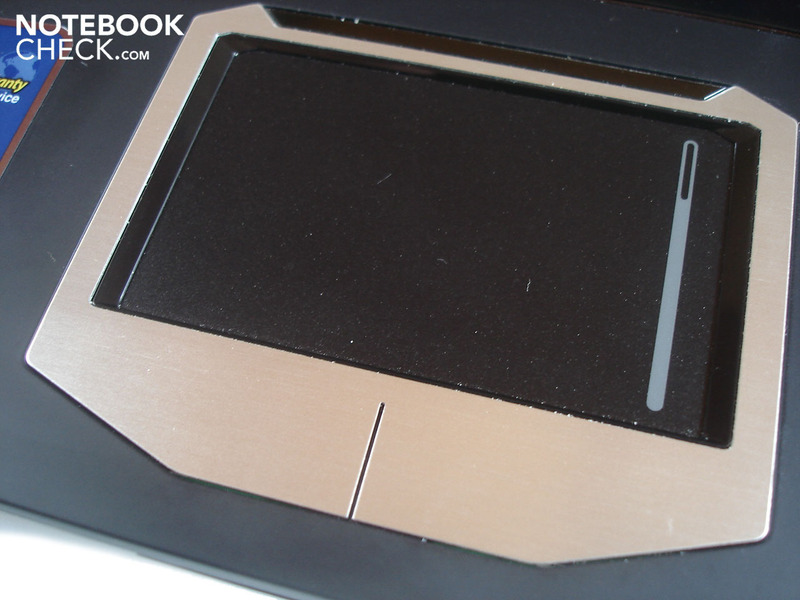 In return, the touchpad makes a good overall impression. The placement and the size are okay. The smooth surface has good gliding traits and the somewhat concave edge provides for a distinct sensory feedback. 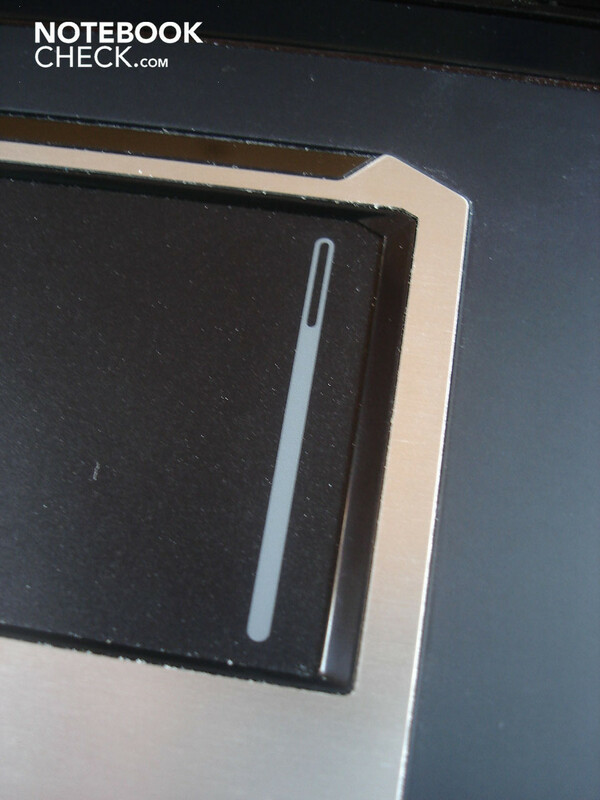 Additionally, the touchpad has a marked vertical scroll bar. Inconceivable is why the scroll field has turned out so unusually broad, which wastes so much of the mouse's room for maneuvering. 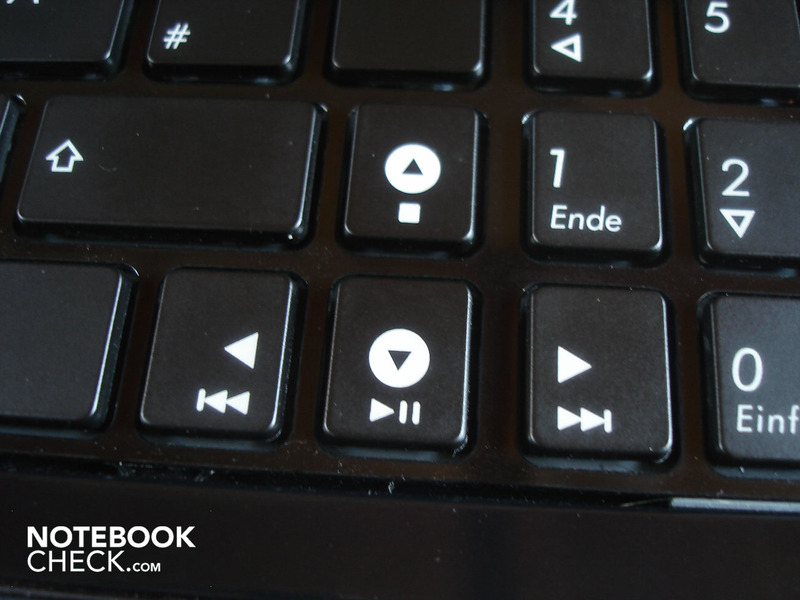 Both touchpad keys are integrated in the high-quality and silver aluminum bezel and bid a good pressure point with a well audible feedback. 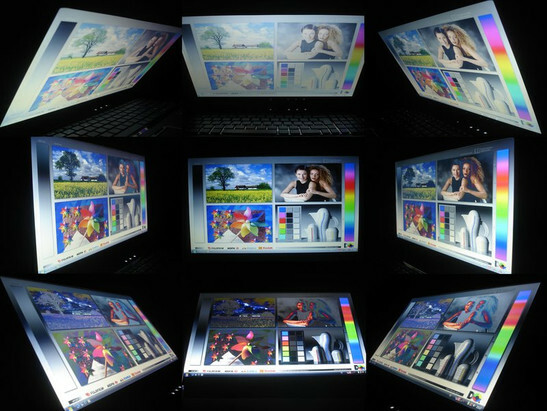 The 16 inch display has an HD resolution of 1366x768 pixels. 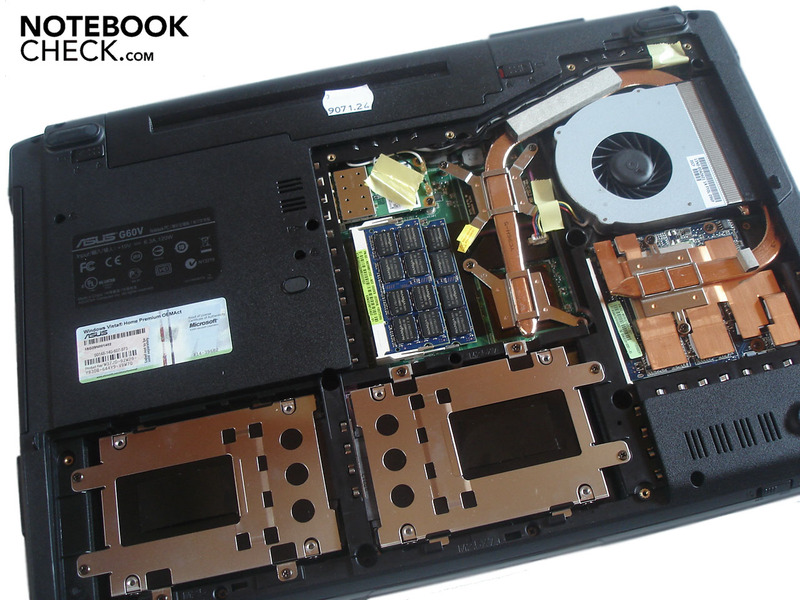 It's controversial if this resolution is too low for a gaming notebook with such efficient components. Our answer is: Both yes and no. The implemented hardware is strong enough to present older games in a resolution range of 1680x1050 and even 1920x1200 smoothly. 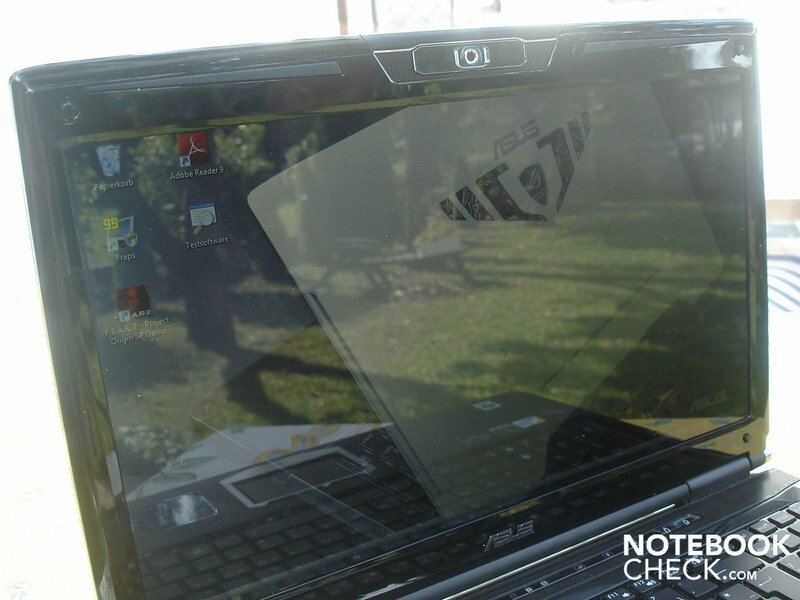 However, the notebook finds its limits in its native resolution of 1366x768, particularly in newer and/or hardware demanding games like Crysis, as the executed performance tests show. 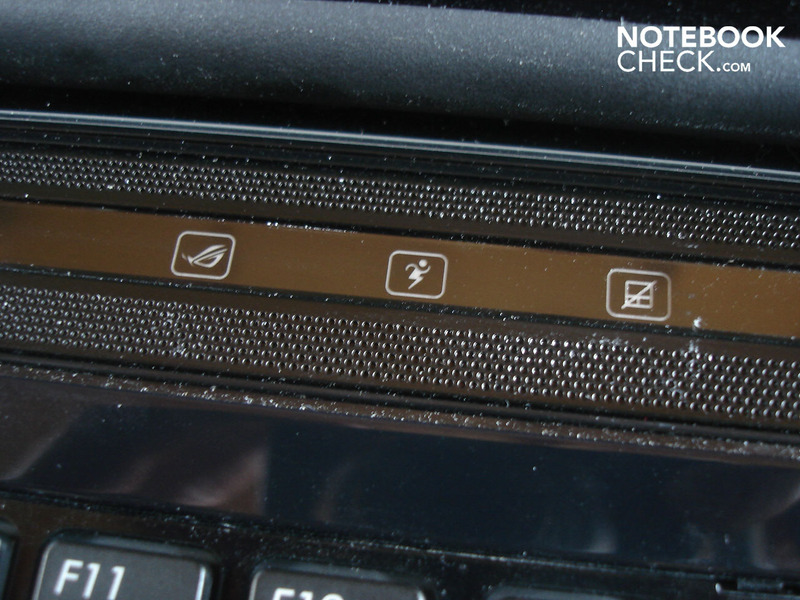 Because the G60VX's display is reflective, a possible outdoor mission is definitely not recommended. It can even come to disagreeable reflections indoors, depending on the light. A dimming is therefore recommendable. The moderate viewing angle is everything but ideal, which left us belching sourly especially on the vertical plane, as the following picture shows. As long as you're sitting in front of the computer alone and use it stationary, you should manage, anyhow. 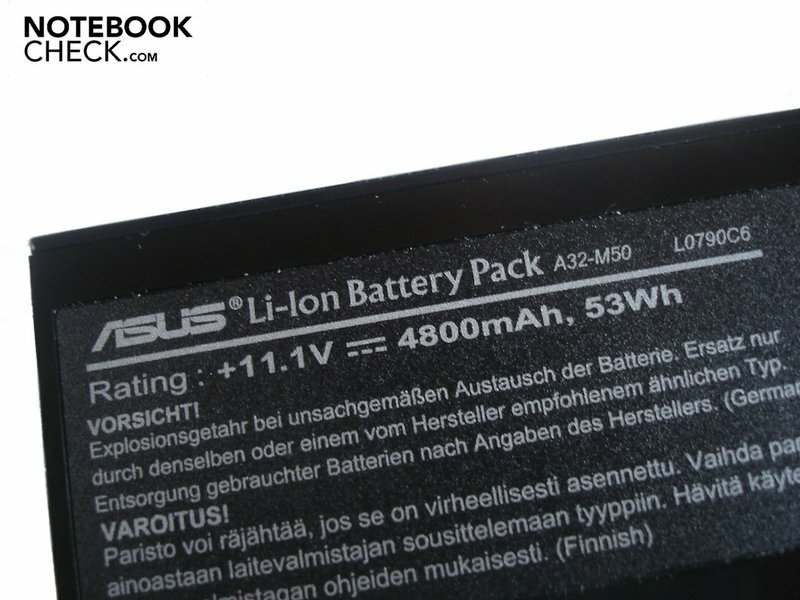 Asus only uses upper-class products for the components. 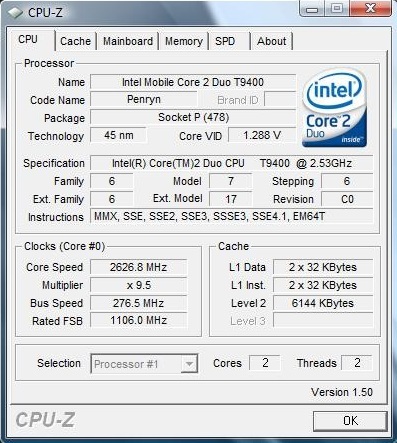 A strong two core CPU with 2.53 GHz, the Intel Core 2 Duo T9400 (6 MByte L2-Cache, 1066 MHz FSB, 35W TDP) is employed. The show-stopper: The CPU can be overclocked up to 2.73 GHz in two levels. We'll see what these extra 200 MHz bring in our benchmarks shortly. 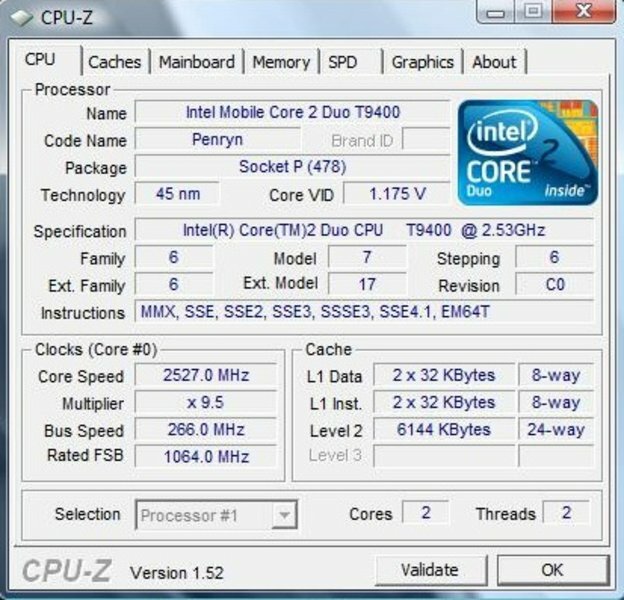 The CPU is supported by a four GByte DDR2 RAM with 800 MHz. Because Asus has, inconceivably, selected Windows Vista Home Premium 32bit, there are only about three GBytes left. 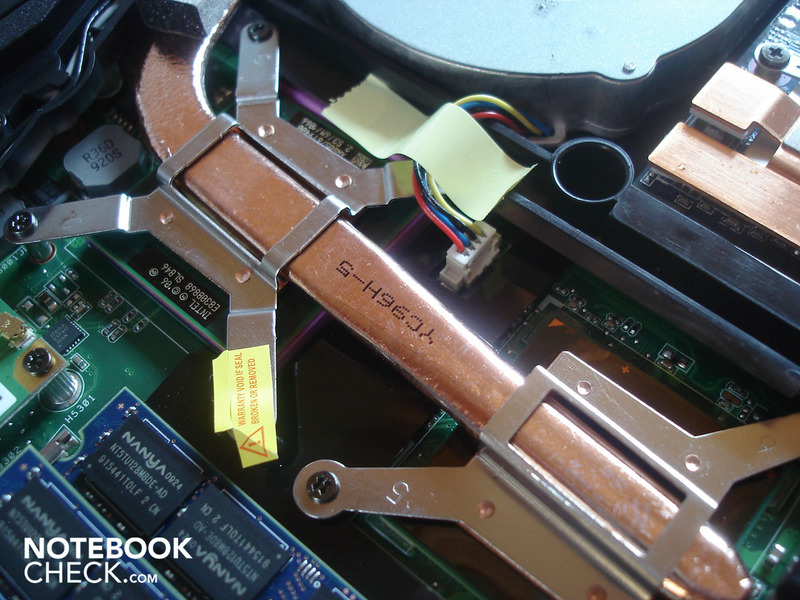 You get a, strapping for a notebook, GeForce GTX 260M with one GByte DDR3 VRAM as a graphic card. Different than the name might let assume, the GTX 260M, manufactured in a 55nm structure width, isn't related to the desktop alternative GTX260, but resembles more the already older GeForce 9800 GTX. 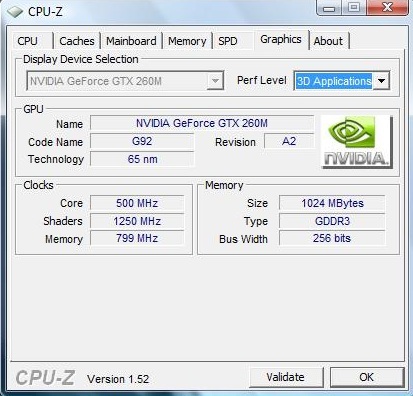 The GTX 260M has 112 stream processors and supports DirectX 10.0, as well as PhysX. A further benefit of the GTX 260M is the integrated Pure Video HD Technology, which supports the CPU at decoding high resolution video material. The GeForce GTX 260 is comparable with the ATI Mobility Radeon HD 4850, whereas the latter is rarely built in and runs 15% faster on average. But let's start with the CPU-prone benchmarks. 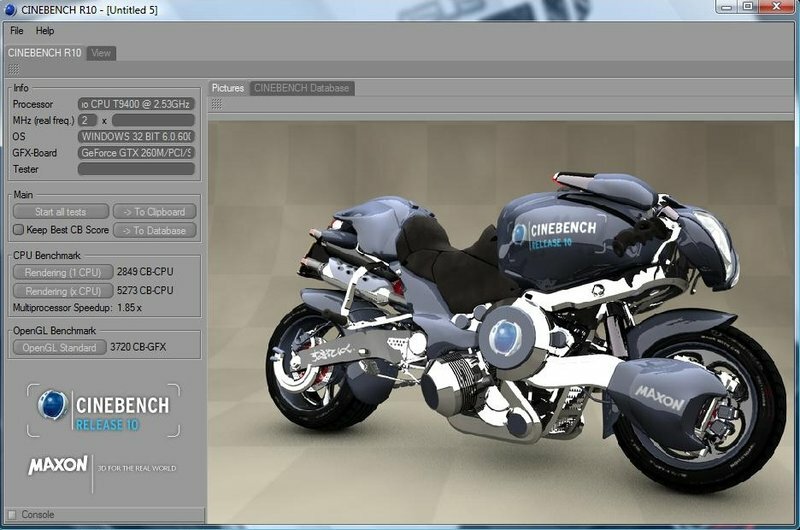 The Core 2 Duo T9400 achieved 2849 points in single-core and 5273 points in multi-core rendering of Cinebench R10. The results increased from only slightly up to a great deal to 2958 (single-core rendering) and 5523 (multi-core rendering), overclocked. 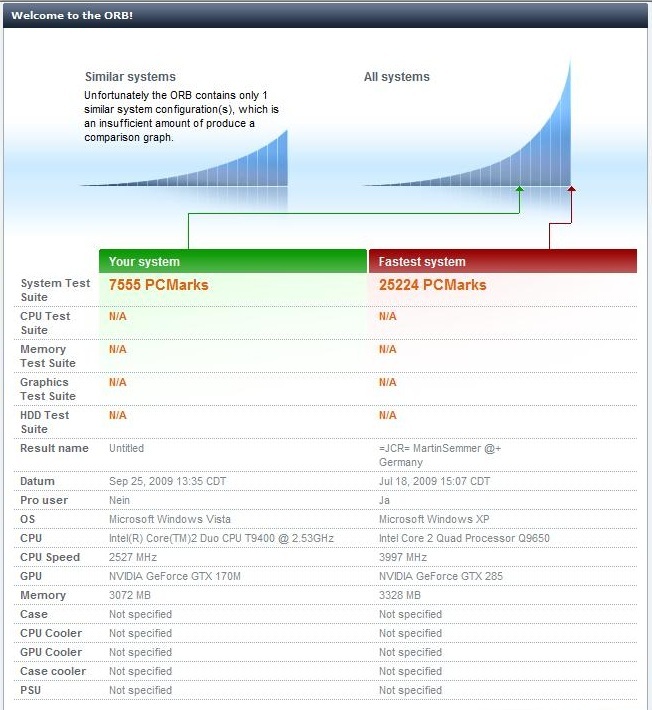 In comparison: a Core 2 Quad Q900 with "only" 2 GHz but four cores computes a bit slower with 2468 points in single-core rendering and, in return, considerably faster with 7893 points in multi-core rendering. The G60VX reached 7555 points in the PCMark05 and in opposition to that, it was enough for 4395 points in the PCMark Vantage. Now the GPU-prone benchmarks follow, in which the built-in GeForce GTX 260M can be more than proud of. The G60VX achieved a very good 15079 points in the 3DMark05, 9458 points in the 3DMark06 and still a respectable 4080 points in the 3DMark Vantage. 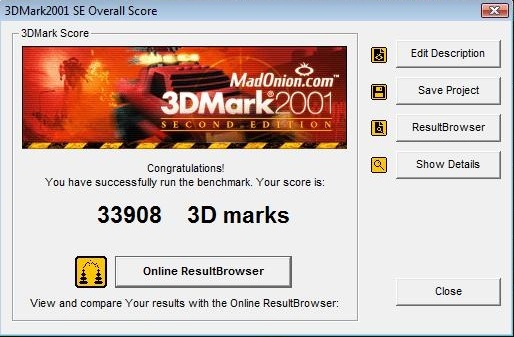 An ATI Mobility Radeon HD 4850 computes from slightly to a lot quicker with 16496 points (3DMark05), 9784 points (3DMark06) and 5500 points (3DMark Vantage). 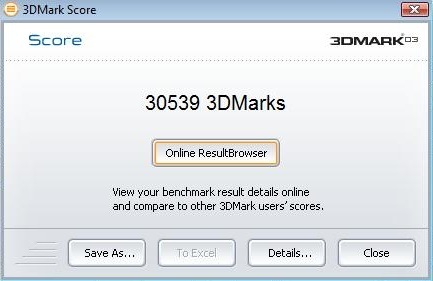 We also ran the 3DMark Vantage in the maximum overclocking of 2.73 GHz. The difference is kept within a limit with 4134 points against 4080 points, though. Asus has selected the manufacturer Seagate for the hard disk. 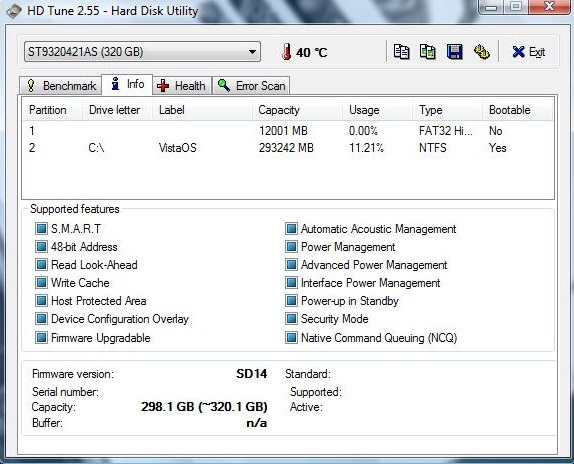 Two hard disks with a capacity of 320 GBytes each do their job at once in the G60VX. 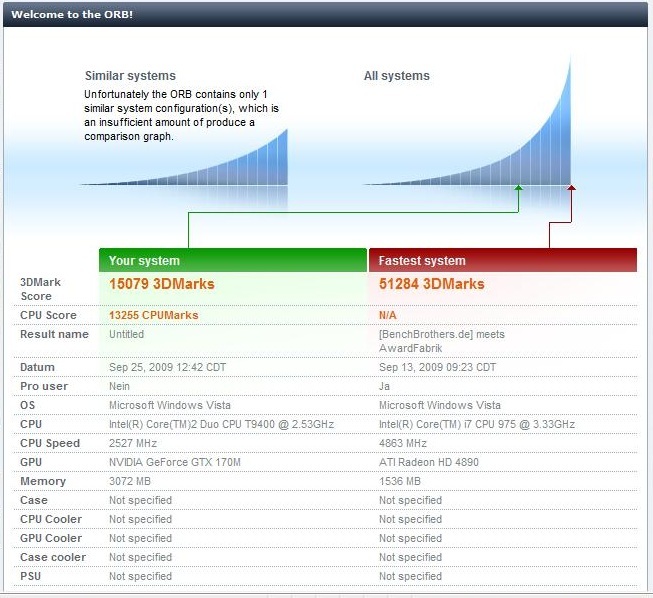 We have established their performance results with the HDTune tool. The system hard disk supplied unstable values. The transfer rate is more than good with an average of 66.3 MB/s, the access rate of 18.2 ms and a throughput rate of 110.1 MB/s remained somewhat under that of what we'd expected. 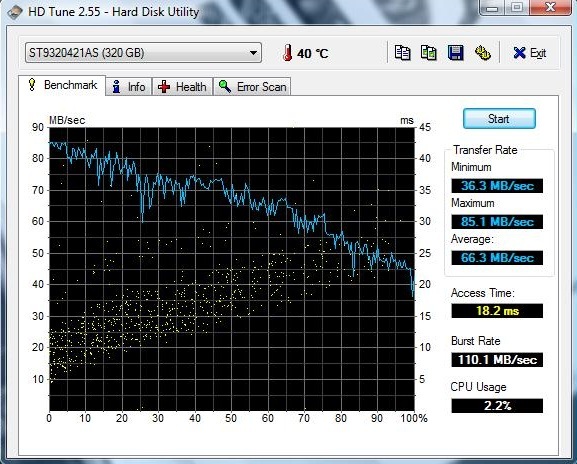 The results of the second hard disk deviate slightly. The transfer rate of 70.3 MB/s was a bit higher and therefore on a good level. In opposition, the throughput rate of 73.4 MB/s turned out rather average. Finally, the access rate of 16.0 ms was somewhat lower. 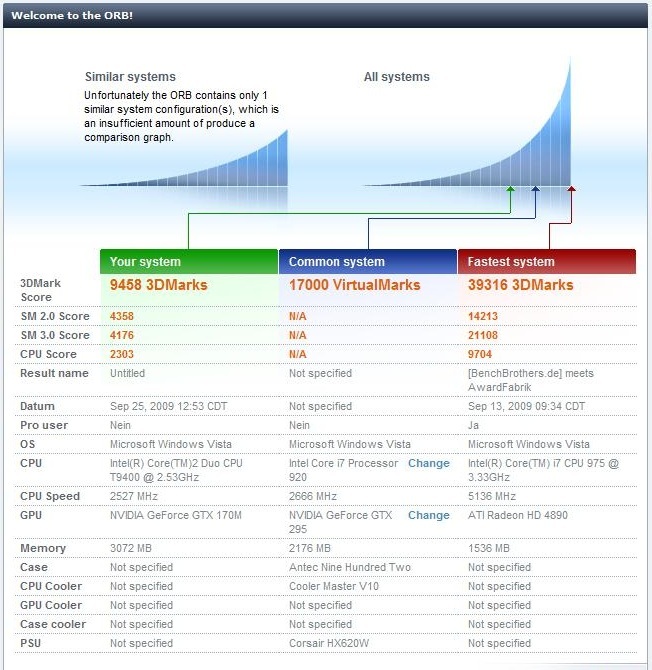 The Windows Vista performance index of the G60VX was overall well-balanced. The CPU was awarded with 5.4 points, the RAM with 5.9 points, the graphic card with 5.9 points and 5.8 points (games) and conclusively and the hard disk with 5.8 points. 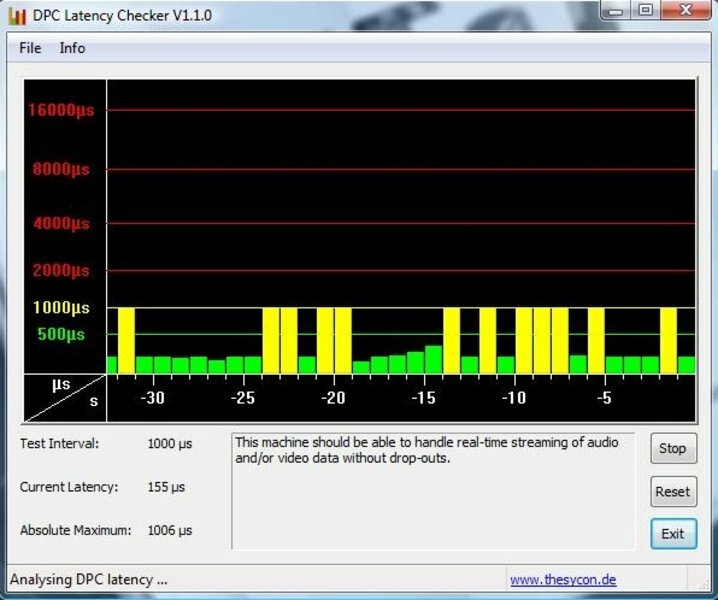 With help from the DPC Latency Checker tool, we also checked the latencies under Windows. Especially at connecting external devices, too high latencies can be negatively noticed (for example sound crackling with external sound cards). The G60VX's latencies were often in an amber field of around 1000µs, but it shouldn't cause any problems when external devices are connected. 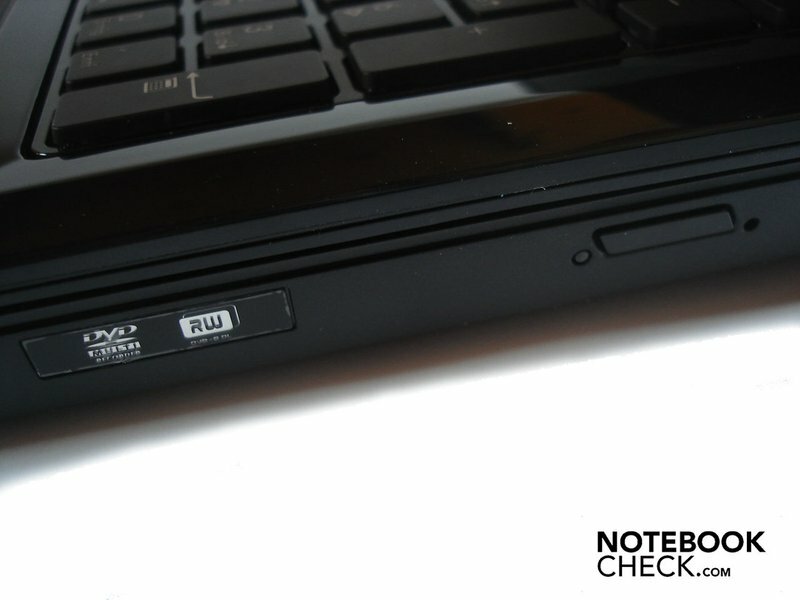 Verdict: the application performance turns out very good and keeps the notebook's promise. An overclocking of up to 200 MHz was noticeable especially in CPU-prone applications, whereas the difference between GPU-prone applications and games turned out rather small. 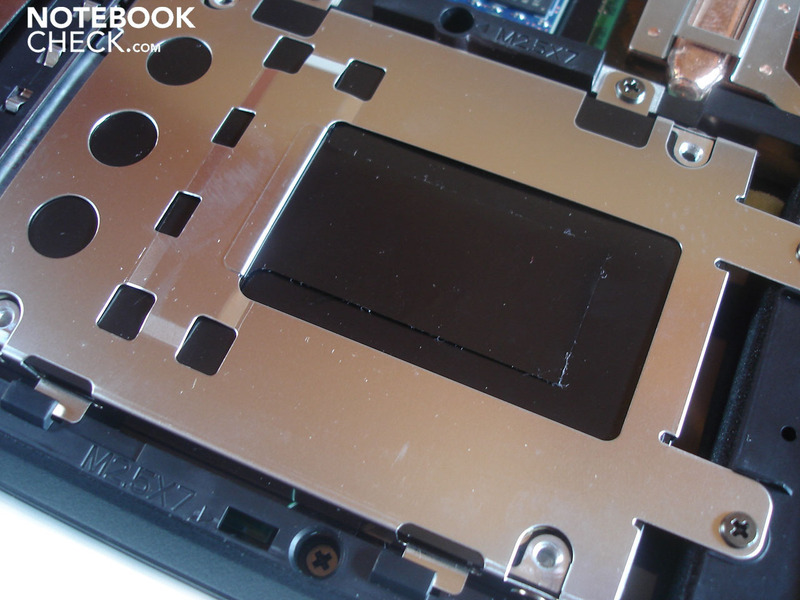 Due to this, we have executed following gaming benchmarks in a non-overclocked condition. 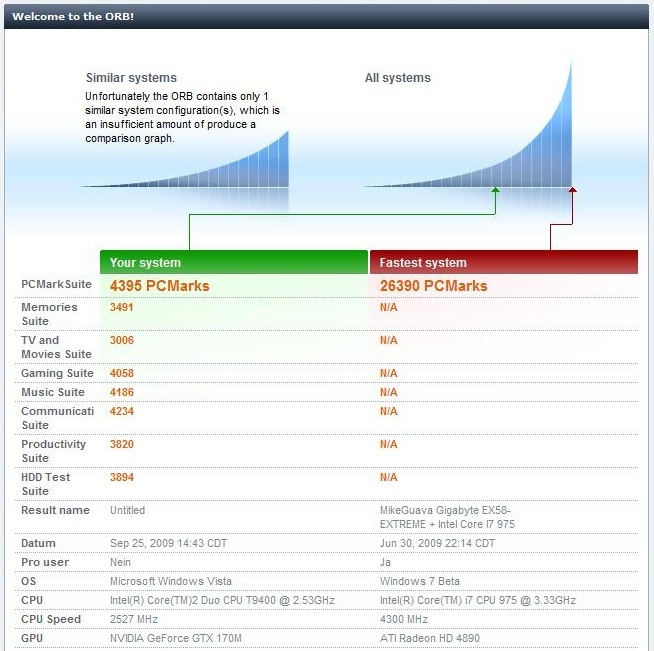 All benchmarks were established in a resolution of 1280x1024, unless otherwise stated. Call of Duty 4 still looks good, but has already been around for a few years. 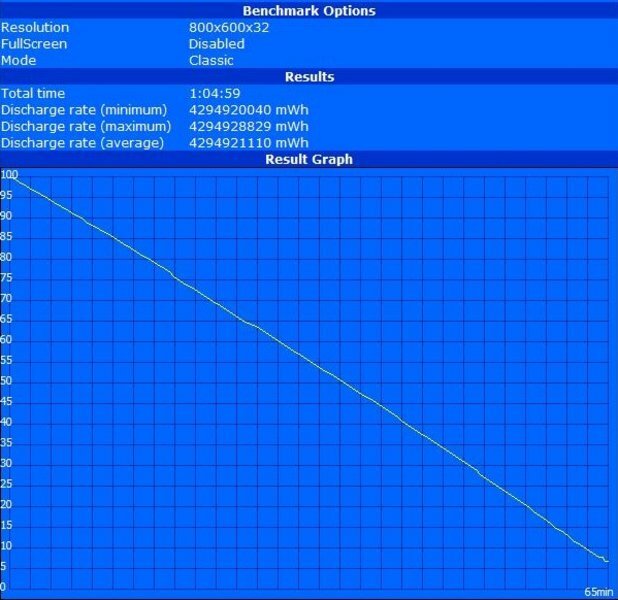 This has also been observed in our benchmark course, where the G60VX didn't have any problems even at high details and 4xAA, and conjured up a very smooth 88.5 fps on the screen. Valve's popular shooter was awarded with a weary shrug from the G60VX and ran as smooth as silk over the screen with an average of 85.8 fps in a resolution of 1024x768 and very high details. In comparison: A GeForce GTX 280M computes still a bit faster in the same setting with 104 fps. Fear 2 was also always smoothly playable due to the GeForce GTX 260M. High details and 4xAA were expressed in a very good 63.8 fps. A Radeon HD 4850 is even significantly faster with an average of 86 fps, though. The only race game in our overview, Race Driver GRID, convinced in high details and 2xXMSAA with an excellent 52.7 fps. 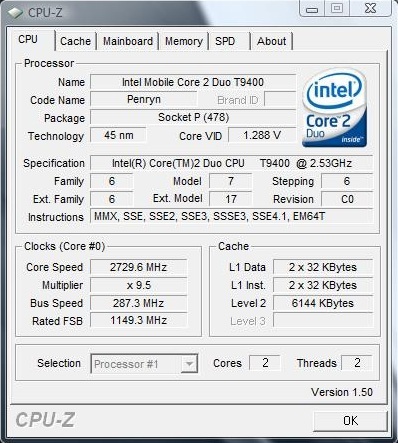 A Radeon HD 4850 is, once again, quite a bit faster with 62 fps. Crytec's showpiece-shooter demands everything from even the most expensive high-end notebooks at high details and therefore, the G60VX has a hard time, as well. 39.9 fps were possible in the GPU benchmark and 35.5 fps in the CPU benchmark at a resolution of 1024x768. A comparison to the Radeon HD 4850 isn't very surprising. With 45 fps in the GPU and 41 fps in the CPU benchmark, it is in front of the GTS 260M. Germany's favorite building series has recently gone into the next round with Anno 1404. The advanced graphics of Anno 1404 is also reflected in the benchmark results. The game ran fairly smooth with an average of 36.2 fps in very high details and 4xAF, but did studder every now and again. A GeForce GTX 280M presents itself as slightly superior with 40 fps. The biggest surprise of all waited in Call of Juarez. The G60VX studdered along with 22.7 fps, despite high details and a resolution of "only" 1024x768. 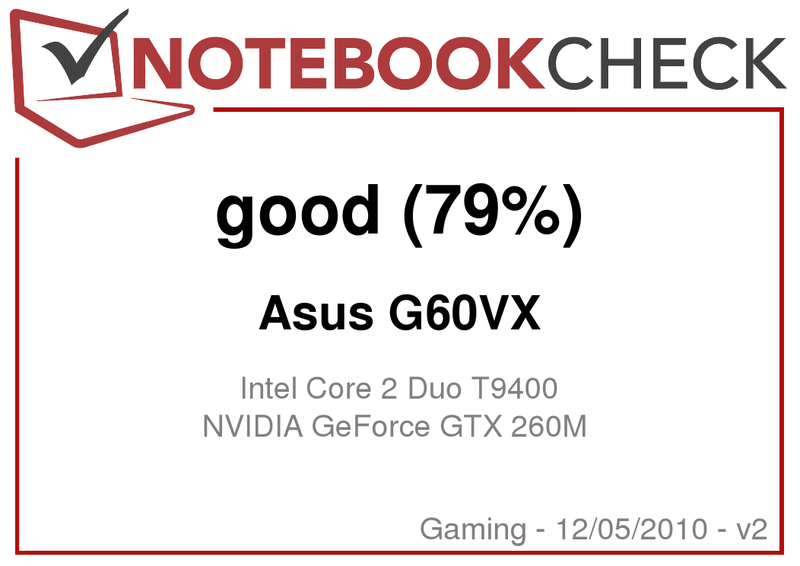 This value appeared a bit strange, as the otherwise drastically slower GeForce GTS 160M still reached 25 fps in Call of Juarez and the Radeon 4850 achieved a significantly faster 43 fps. The value didn't improve even with the maximum overclocking of 2.73. First, as we updated the graphic driver did the average refresh rate slightly increase to 24.4 fps. Verdict: The given gaming performance is overall very good. 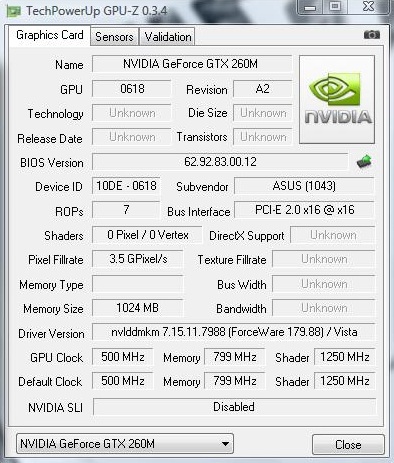 Apart from a few exceptions, even high details didn't represent a problem for the GeForce GTX 260M. The GTX 260M shows itself considerably faster than middle class card of the types Radeon HD 4650 or GeForce GT 240M. 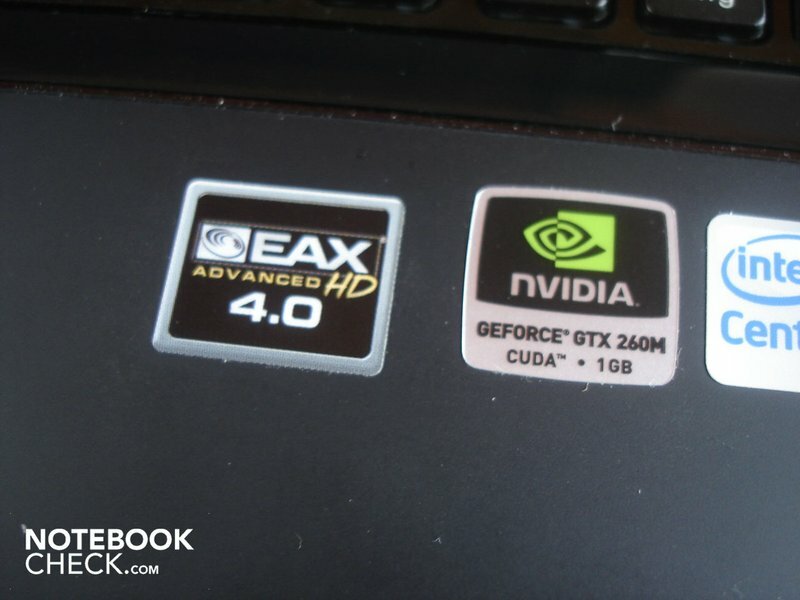 However, the GTX 260M can't quite keep up with the about equal Radeon HD 4850. The G60VX already attracts attention in idle mode with 36.2 dB(A). 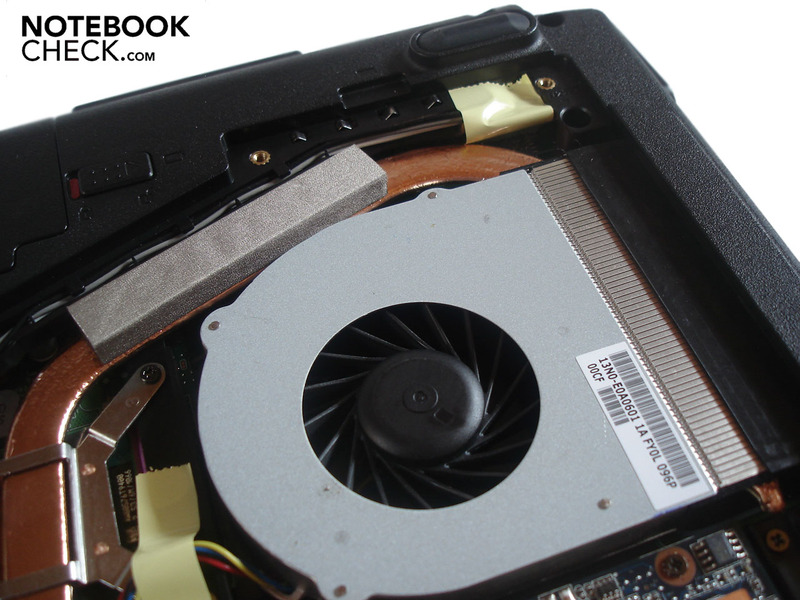 If the notebook is put under load, the fan volume rockets to an unpleasant 37.4 to 44.5 dB(A) right away. The drive is also very noticeable at DVD rendering with 36.6 dB(A). 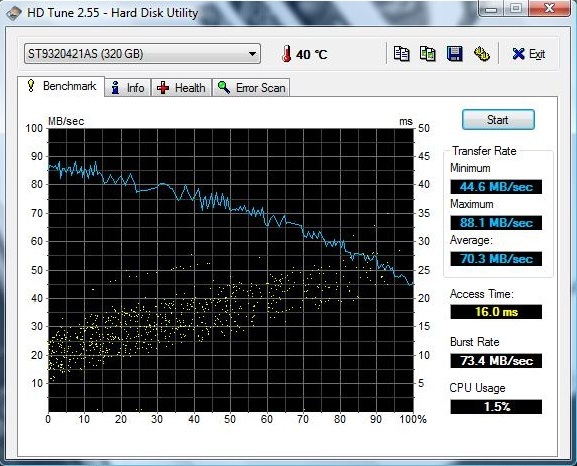 Finally the hard disk attracts attention with 36.9 dB(A). Generally, the noise development turns out to be fairly high. This is (unfortunately) almost standard in gaming notebooks and shouldn't disturb the majority of the long-suffering gamers too much. All evaluations were made at a distance of 15 cm. 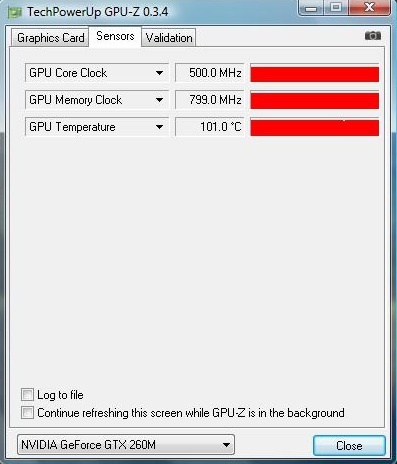 The temperature of the G60VX turned out average. The upper side heated up to a maximum of 37.1°C in idle mode (max. 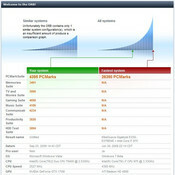 energy savings options, two hours runtime), whereas the bottom side reached the same maximum temperature of 37.1°C . 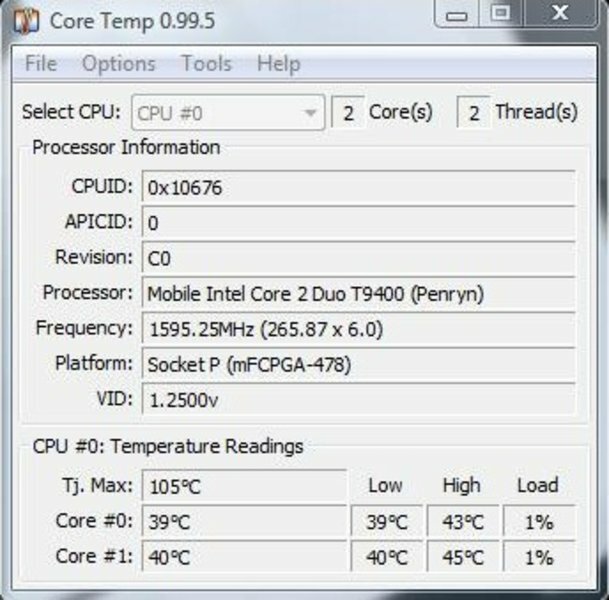 The upper side's temperature increased up to 40.1°C under load (one hour Prime95 + Furmark). 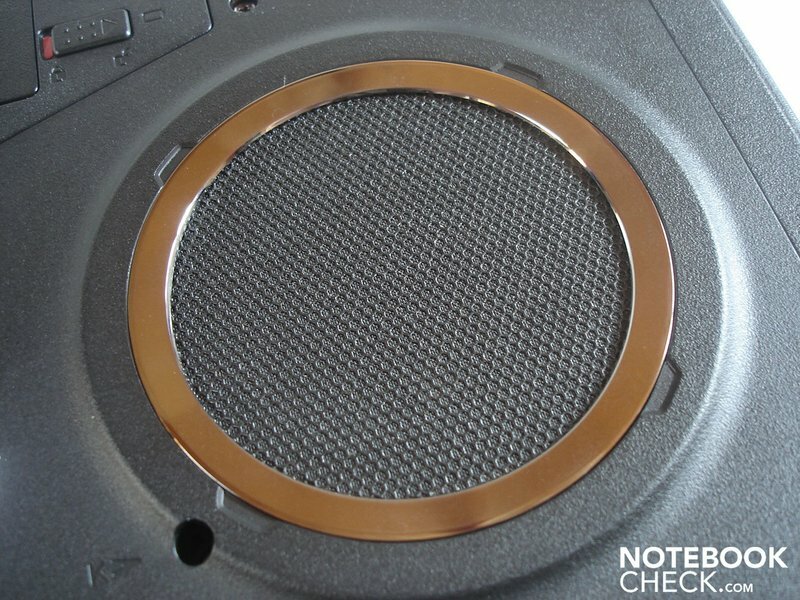 The bottom side gets even warmer under load with up to 45.9°C. The palm rests heat up decently to a maximum of 35.8 °C under load, but aren't yet unpleasantly warm. 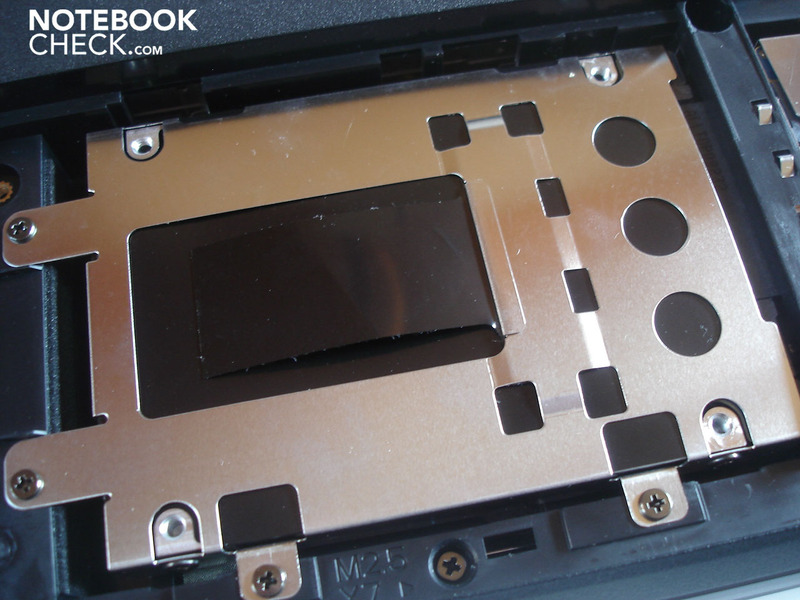 Let's take a look under the G60VX's hood. Starting with the graphic card which is cooled consistently at around 53.0°C in idle mode. 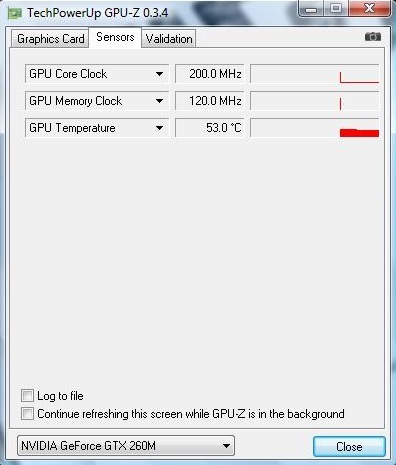 In return, the GeForce GTX 260M's temperature rises up to a far too high 101.0°C under full load. Therefore, Asus hasn't achieved keeping the graphic card within an acceptable frame, despite the clever cooling system and the fast rotating fan. It looks quite a bit better with the CPU. 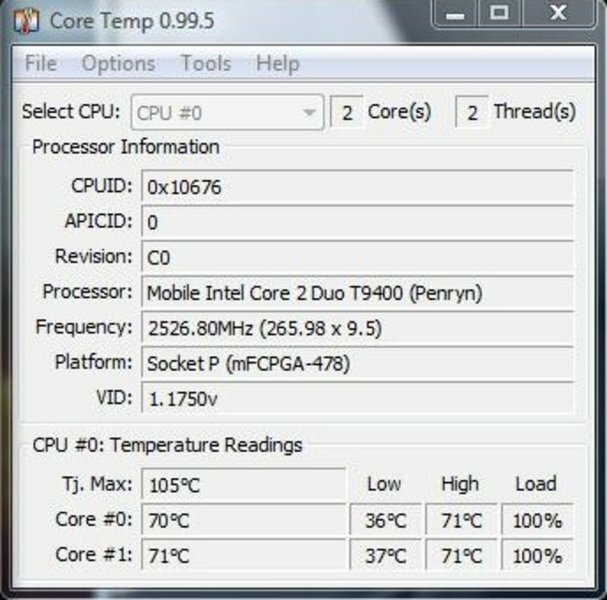 The Core 2 Duo T9400 reached about 40°C in idle mode, whilst it is up to 70°C under full load. Surprising: When the maximum turbo mode is activated, neither the temperature of the CPU nor the graphic card increases any further. 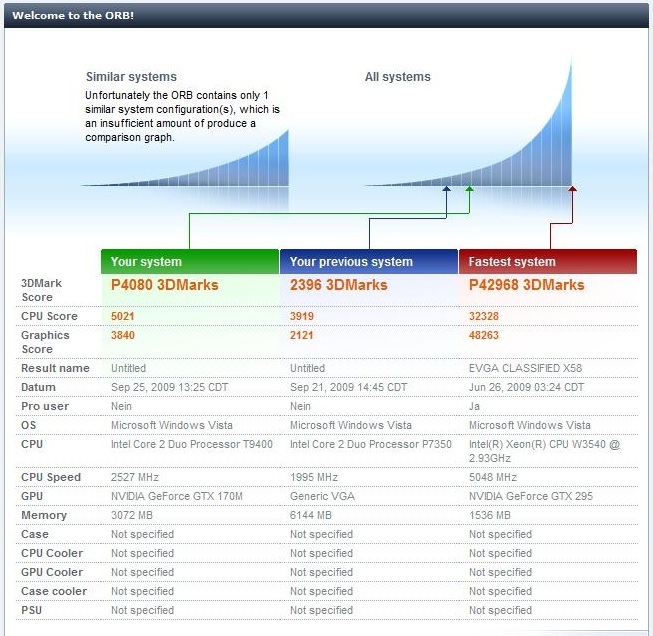 To establish the system stability and the temperature development over a longer period of time, we have put the G60VX to a twelve hour stress test with Prime95 and Furmark. The graphic card stayed at a high, unvarying level of 100°C even after 12 hours. In return, the CPU temperature settled to an acceptable 67°C. We started a 3DMark run-through immediately after the stress test to see if the notebook throttles itself due to the high GPU temperature. We can give the all clear signal in this case. The G60VX runs as fast as afore. (±) The maximum temperature on the upper side is 40.1 °C / 104 F, compared to the average of 39.3 °C / 103 F, ranging from 21.6 to 68.8 °C for the class Gaming. Principally, most notebooks have to surrender when it comes to sound. The G60VX isn't an exception either, despite EAX 4.0 support. The sound range is well-balanced, but the trebles fray easily and the bass is too indistinct, soft and has little volume. Generally, the sound also makes a slightly tinny and artificial impression. 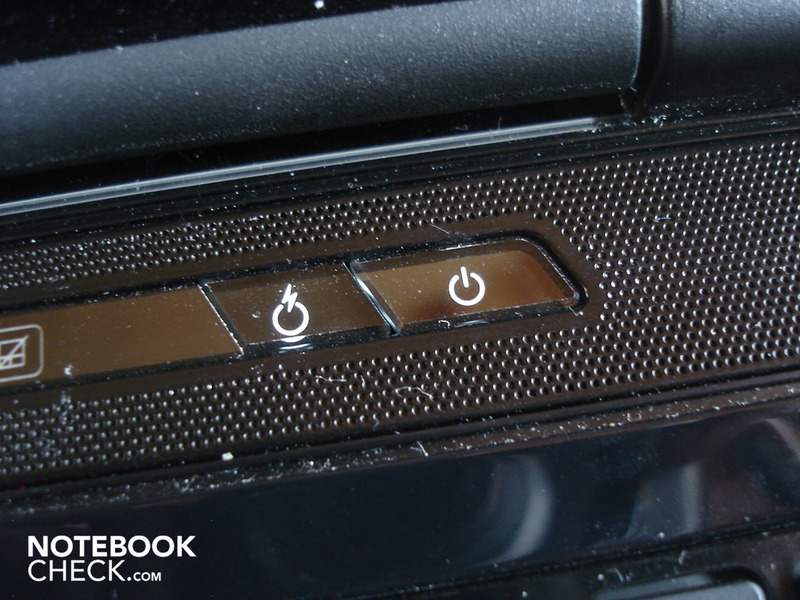 The sound improves greatly when the G60VX is connected to an external sound system. 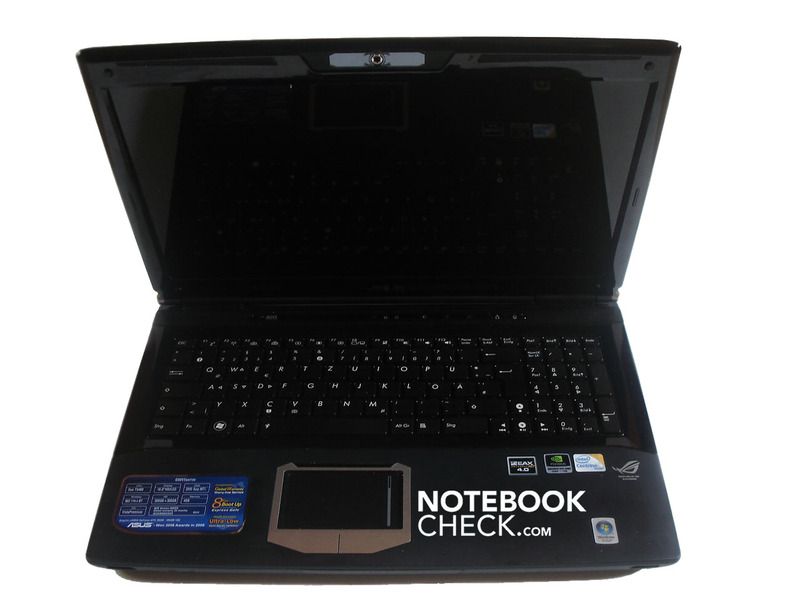 Before we look at the battery life, we should occupy ourselves with the G60VX's energy requirement. 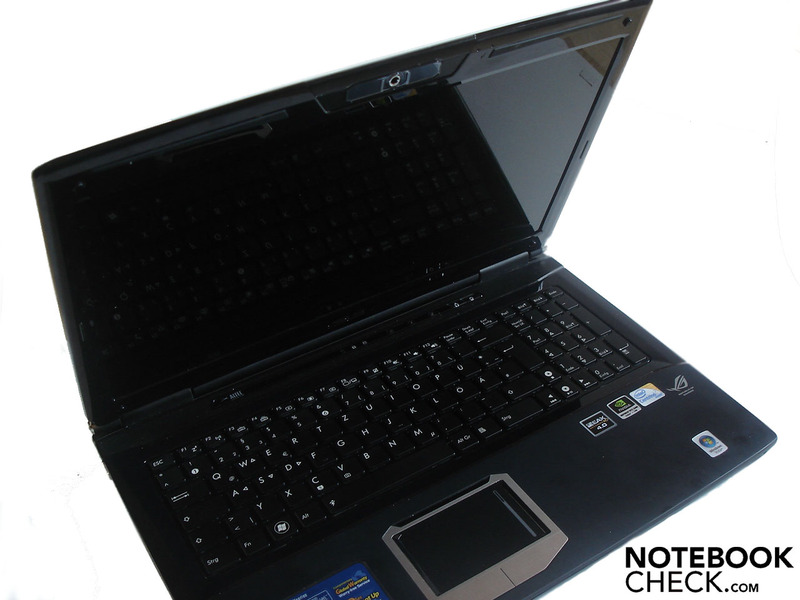 The notebook allows itself between 23.2 and 29.7 watts in idle mode, which still is a moderate power consumption. 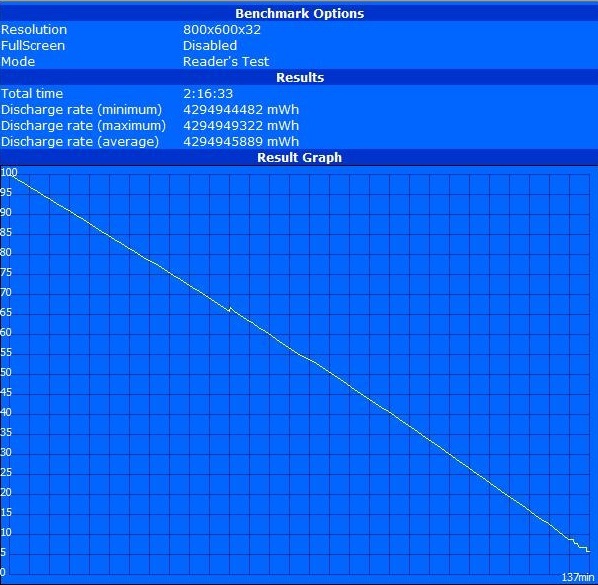 The G60VX gets even more thirsty under load and drains between 86.8 and 116.9 watts out of the mains. The consumption reduces itself to 0.2 in a deactivated state and in standby mode to a (too high) 0.7 watts. Note: The big adapter included didn't only heat up properly with up to 59.4°C but also emitted a disagreeable beep tone every now and then during our tests. If this is a general problem or if we simply had bad luck with our prototype can't definitely be said. Die Akkulaufzeit des G60VX fällt insgesamt mager aus. So liegt die maximale The G60VX's battery life turns out overall meager. 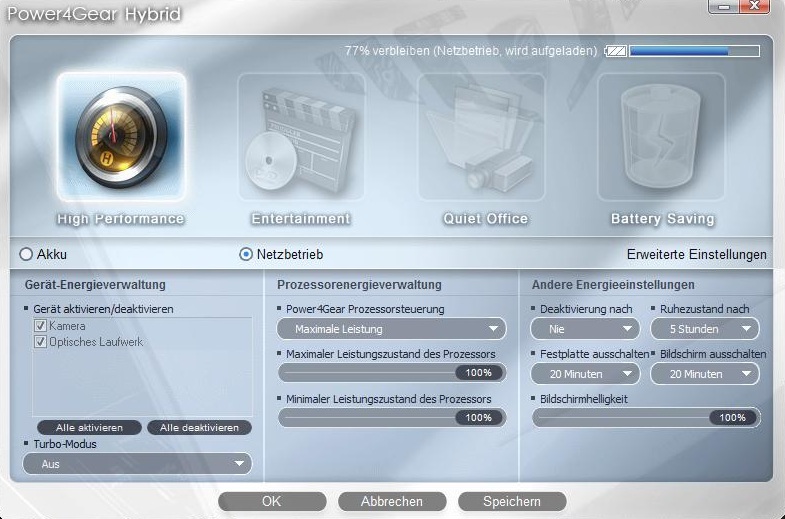 The maximum runtime with minimum brightness and maximum energy savings mechanism is 2 hours and 16 minutes (BatteryEater Reader's Test). 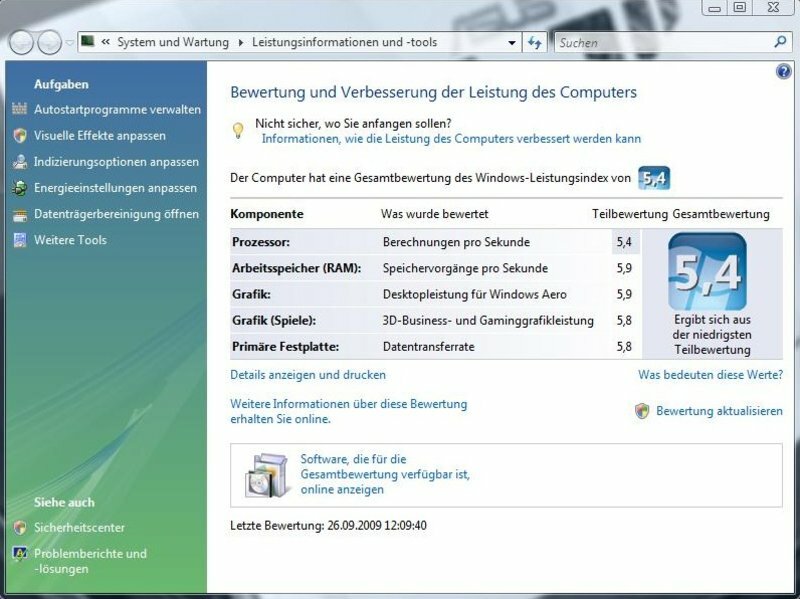 Turning up the display brightness to its maximum and surfing with WLAN in moderate energy savings settings, lets the G60VX already runs out of breath after 1 hour and 50 minutes. Merely 1 hour and 20 minutes is even possible at DVD rendering. 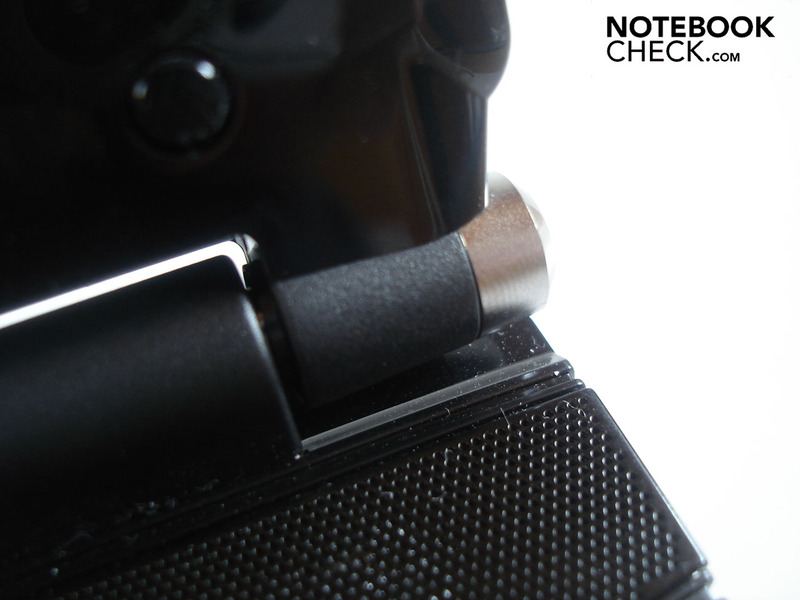 Therefore, it's not really a wonder that the notebook runs out of juice after 65 minutes under full load and without energy savings mechanisms (BatterEater's Classic Test). Summing up, the G60VX leaves an unbalanced, but generally good impression. On the con side, there are the disappointing battery life, the moderate sound and the display's poor luminosity. Additionally, the noise development on the one side and the GPU temperature on the other, are too high under load. The G60VX also has its flaws in regards to stability. The keyboard hasn't been fixated properly and yields under pressure. 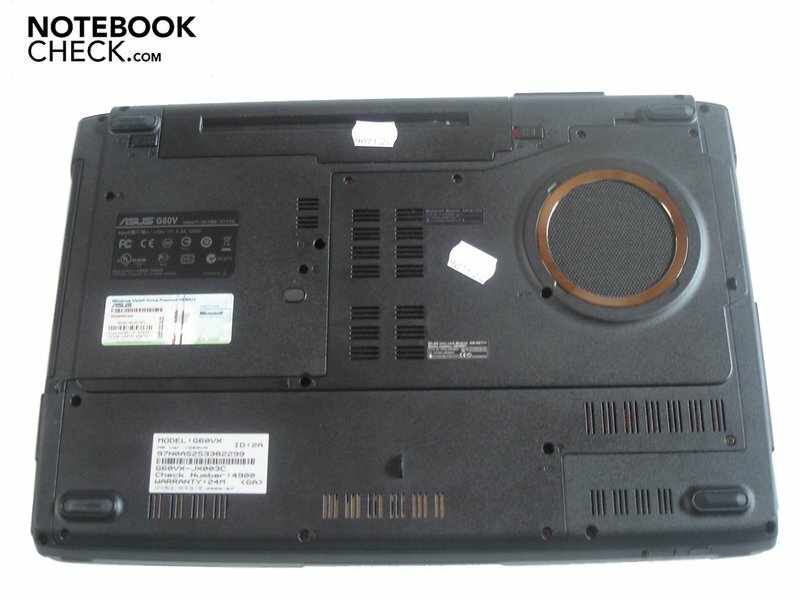 Furthermore, the notebook lid presents itself as very instable on its back as well as on the display bezel and the area between the hinges. 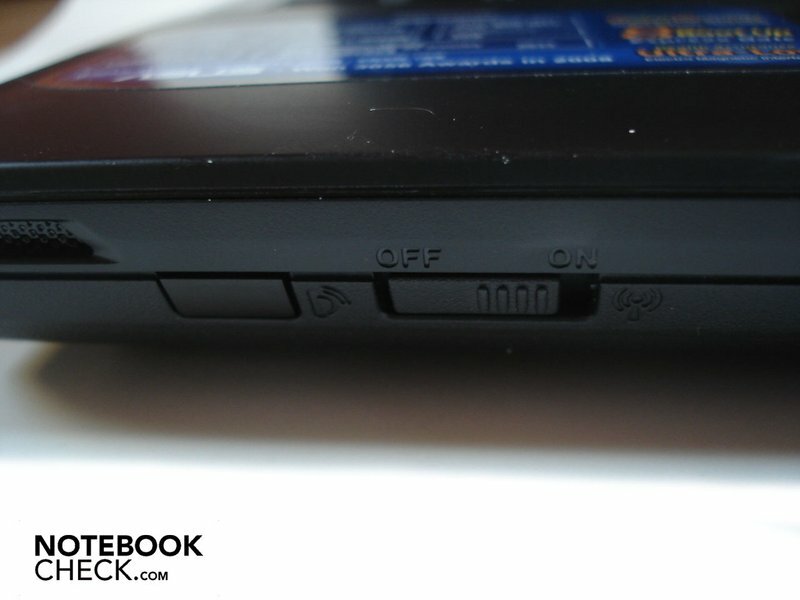 In view of this, Asus still needs to make a few improvements. On the pro side there is the attractive, futuristic design with its discreet lighting, which isn't as exaggeratingly eye-catching as for example the G71GX from the same manufacturer. 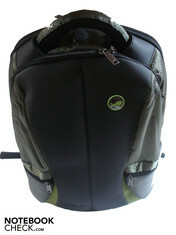 Besides this, the G60VX can convince with a broad range of connections and opulent supplies in the way of a high-quality backpack and the excellent mouse "Razer Copperhead". Above this, the G60VX's superb gaming performance is the biggest plus point. 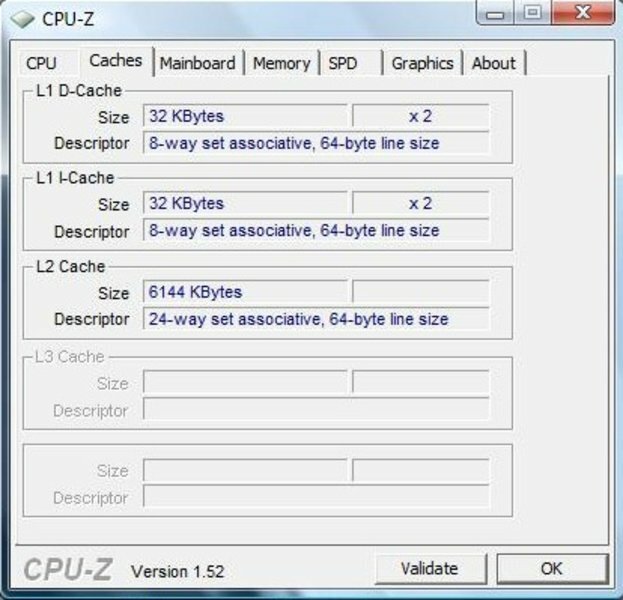 Due to the GeForce GTX 260M almost all available games can be played smoothly in the native resolution and high to maximum details. 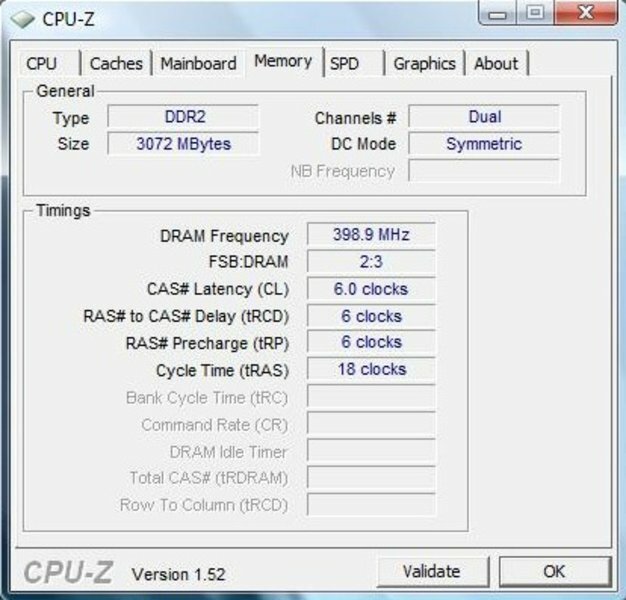 Solely extremely hardware demanding games, like Crysis, run continuously smooth in medium details. Therefore, our verdict is: Those who primarily put value on high gaming performance and aren't deterred by the somewhat too high noise development, can take the G60VX almost without hesitation. A further Republic of Gamers logo on the rubber-coated palm rests this time. The attractive design with its futuristic characteristics. Also the numerous connections and the very high application and gaming performance. A considerably better display lid quality. Furthermore, a lower noise development and a higher battery life. Finally, a more luminous display and a better sound would have pleased us, too. That the turbo mode barely provides more performance in gaming on the one side and on the other, that it barely has any influence on the temperature or soundscape. The generous supplies in the way of a high-end gaming mouse (Razer Copperhead) and a universal backpack surprised us, also. 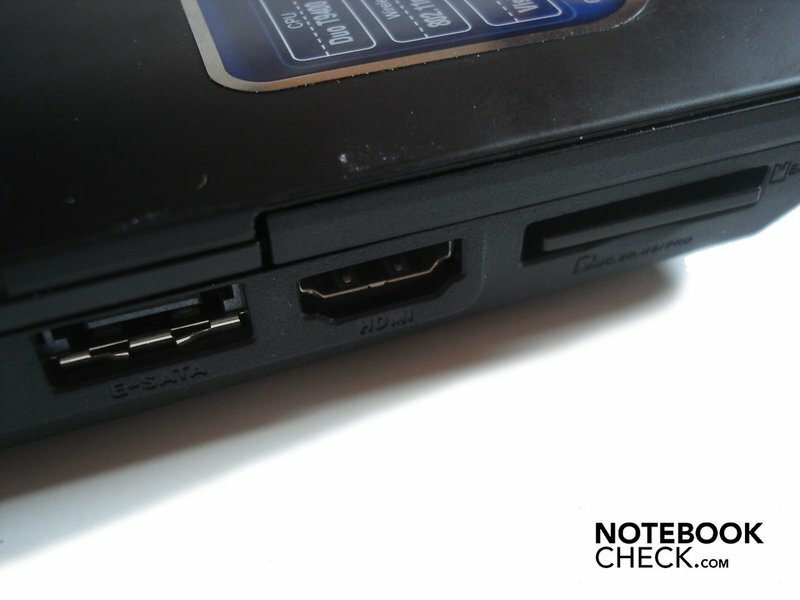 Weaker, but cheaper gaming notebooks like the MSI GX623 or MSI GT628. Other efficient gaming notebooks under 1500 Euros like the MSI GT725 or the Asus G71GX.